I’ve been getting in to tea subscription boxes in a big way over the last few months! I have a few regulars but recently started to wonder what others might be out there? After doing a bit of research I found Curious Tea and reached out to them, they were happy to send me one of their boxes to review. 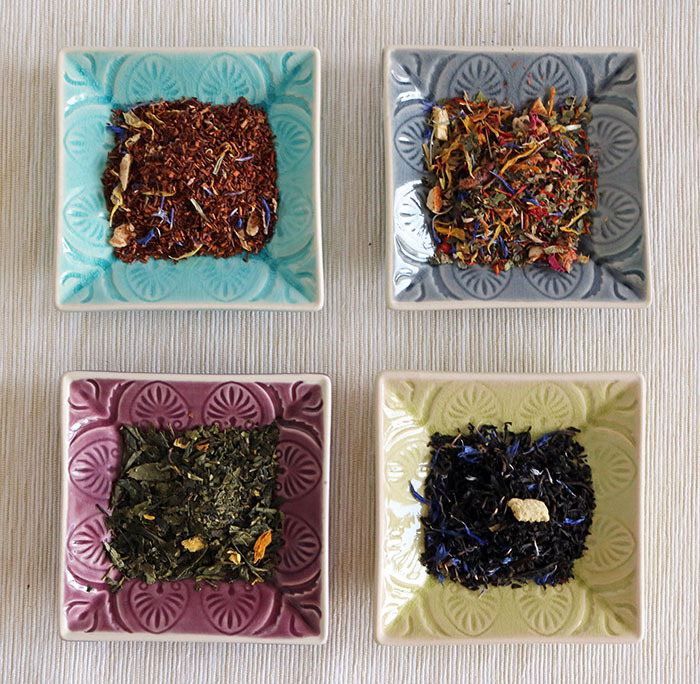 I received their Discovery box which includes 4 different teas a month with 10g of each, the perfect choice for a tea blogger or if you enjoy variety! 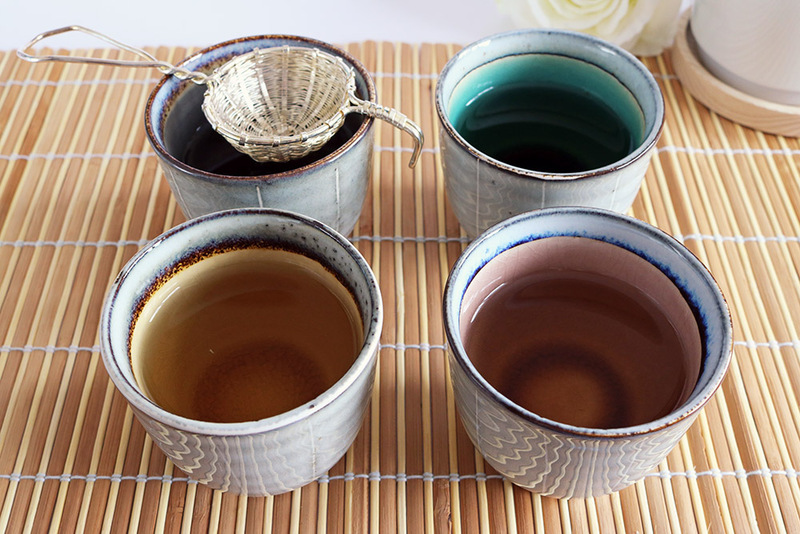 You can also choose between their Classic box which includes 2 teas but with 50g of each so it really depends if you want the variation of 4 teas or more of 2 teas. There’s also the option to take out the subscription either monthly or quarterly with quarterly being slightly cheaper. Next up is a black tea from the Blue Mountains of Southern India. 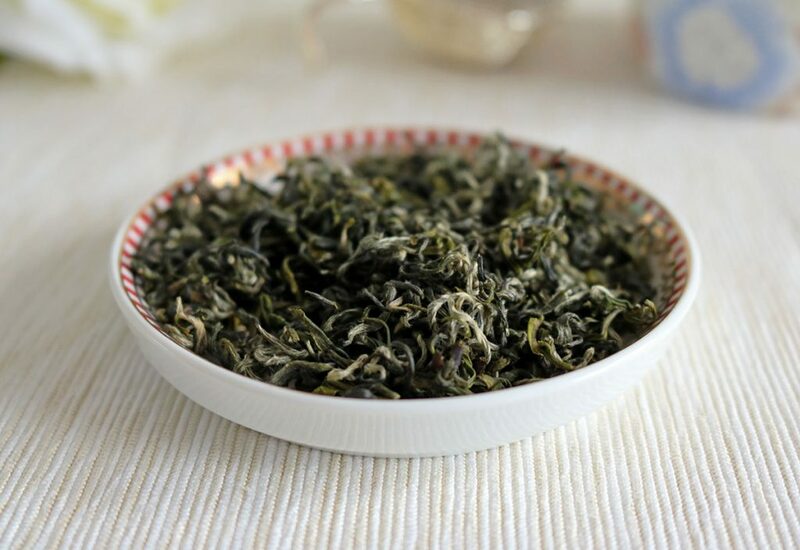 I especially enjoy watching the hand rolled leaves resembling pearls, open up as they steep. Due to how much this tea expands as its steeped it really goes a long way, meaning it’s definitely a tea I’ll be drinking a lot of! I love the deep malty flavours, combined with subtle fruity notes. This was probably my favourite from my subscription box. 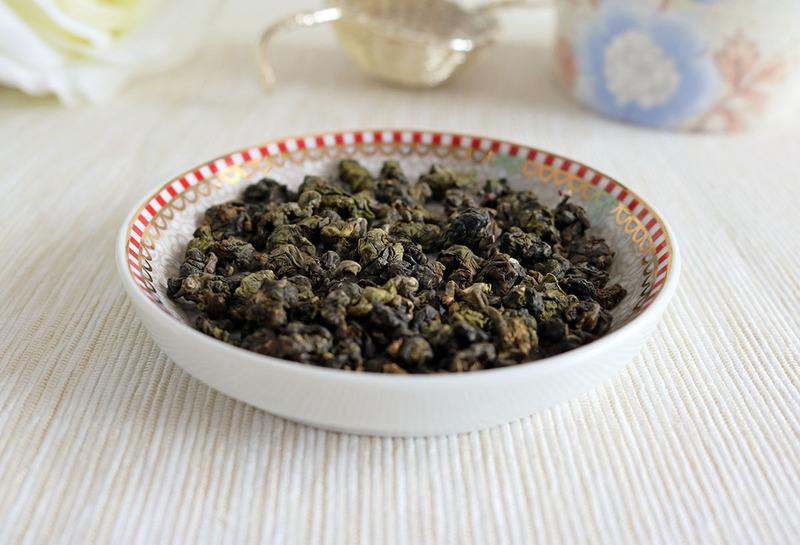 I especially enjoy oolong and have been addicted to its beautiful, but subtle sweetness. 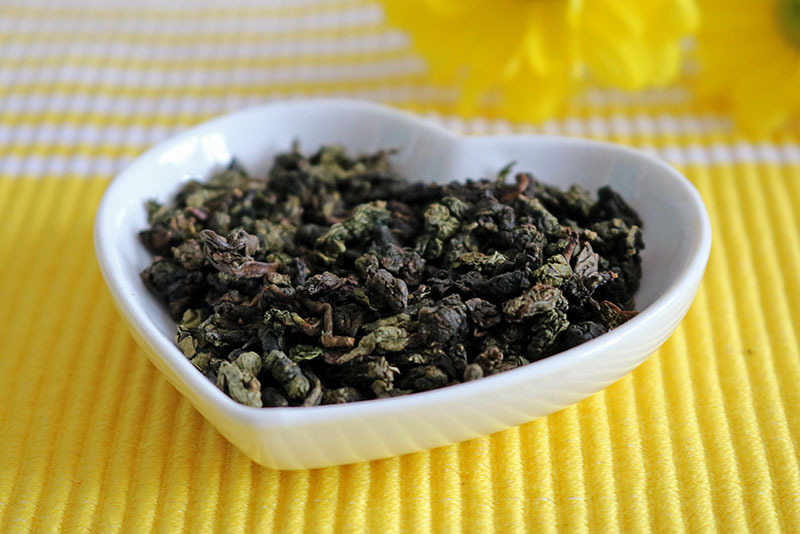 It’s not overly sweet but the fruity notes are very prominent and blend amazingly with the delicate oolong goodness. 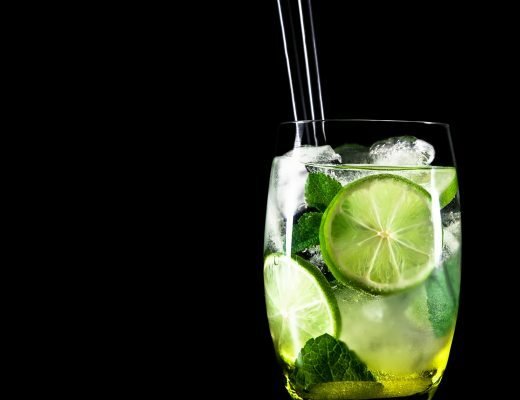 It produces a pale green liquor with a delicate green tea flavour. The flavour is primarily vegetal but with a sweet buttery aftertaste. This is definitely a tea I’ll be enjoying a lot in the upcoming weeks! I’ve thoroughly enjoyed my Curious Tea subscription box, it’s been a positive experience throughout and one that I’d highly recommend. A lot of the companies I work with send me predominantly flavoured tea, which I’m a huge fan of but it’s been nice to try these more traditional teas. The last couple of weeks I’ve been finishing my final assignment for the year. This week my focus is shifting to revising for my last exam of the year, it’s been massively stressful! I wasn’t sure what to expect from this tea and couldn’t imagine what it would taste like after smelling it but I was pleasantly surprised. 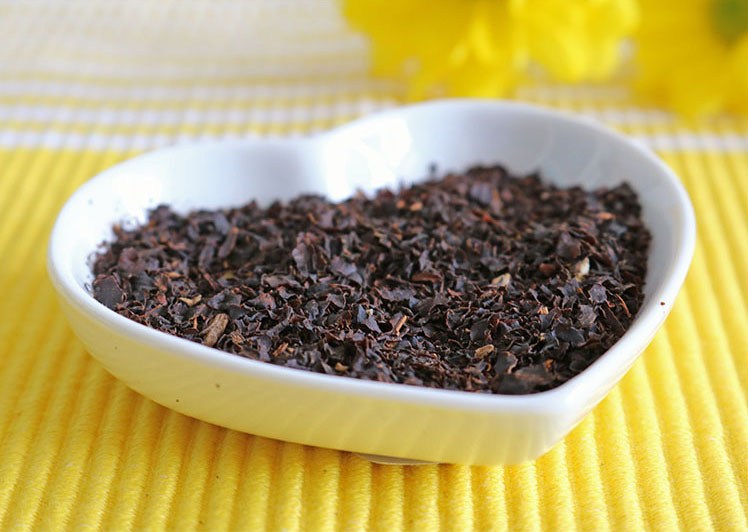 The tea produces a deep chocolate coloured brew with extremely satisfying toffee notes. There’s a slight chilli hit that adds a much appreciated element of excitement. An all round good blend but don’t be put off by the smell or you’ll miss a unique and exciting tea! 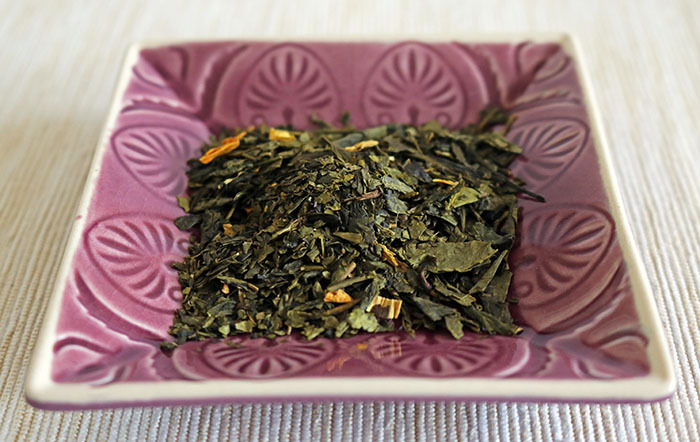 The taste of the green tea element of this blend is fantastic and the fruity flavour is sweet but doesn’t overpower the drier vegetal flavour of the green tea. Another blend I’m sure will be awesome iced and super refreshing on the warmer days of the summer ahead. Ginger beer isn’t a drink I’ve ever really drunk so I wasn’t sure what to expect with this blend but I was definitely intrigued! 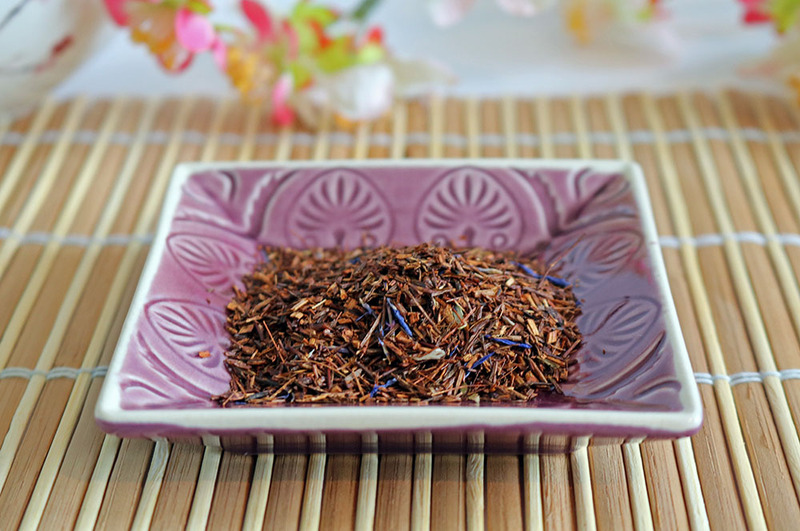 The tea is a rooibos based blend which Bluebird are particularly good at making. There’s a really refreshing lime scent which creates a nice lime aftertaste, which is accompanied by a hint of caramel. The ginger flavour is the most noticeable alongside the nutty rooibos goodness, with the combination of lime and ginger creating an almost fizzy mouth feel. As soon as I opened my Bluebird delivery and saw Pineapple Sorbet I couldn’t wait to try it. It literally smells like a sweet shop with a smell that reminds me of pear drops. 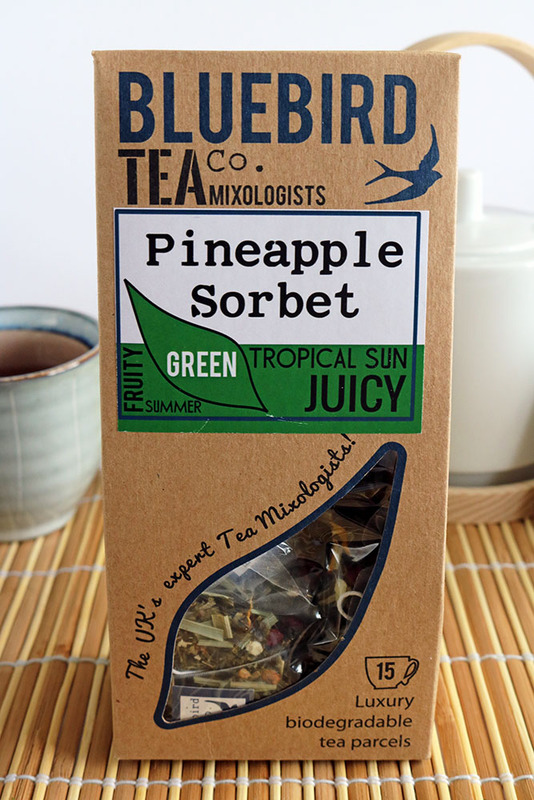 It’s another blend that instantly makes you think of summer and the tea itself looks really pretty Pineapple sorbet’s sweetness is perfect to serve iced without needing to add any sugar or honey. I received this blend in pyramid teabags which are generously filled and easily make tea for two. This is one of my favourites from these new Bluebird blends! All nighter is one of the teas I was most excited to try, due to it being a tea and coffee combo. I really don’t like coffee and wouldn’t ever choose it over tea but it’s a combination I’ve never tried before which is always exciting. It actually smells incredible with a nice roasted coffee scent with green tea and an enticing chocolate hint. One thing that I struggle to do when my workload is huge is relax so I was pleased to see a Bluebird blend to help me take a break. Chamomile tea is always welcome in my tea cupboard but I find it’s one of those blends that when it’s bad, it’s really bad! As expected Bluebird’s twist on chamomile tea is one of the best I’ve tried. 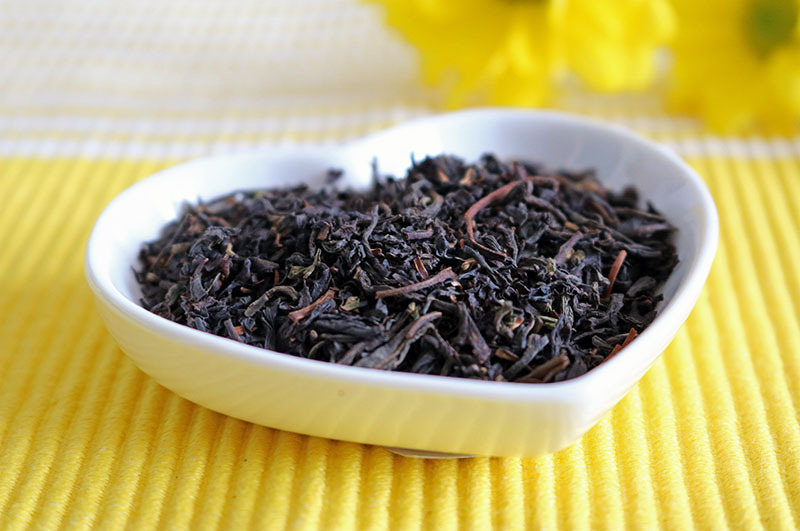 It smells mind blowing, with a candy apple sweetness alongside a delicate aroma of white tea. 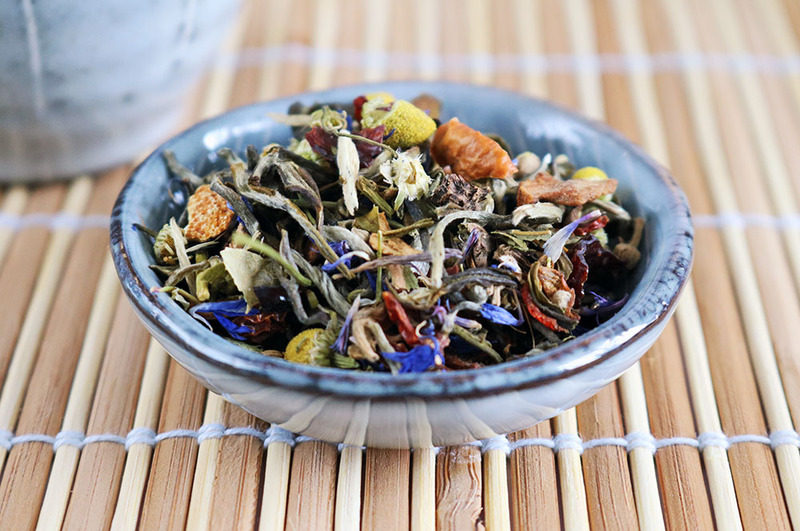 I sometimes receive chamomile tea to review that is really overly floral and not very sweet but the addition of apple and white tea brings the chamomile flavour down a notch. There’s also an addictive honey aftertaste that keeps me coming back for more! All round this is a fantastic delivery from Bluebird with some of my all time favourite Bluebird blends. These teas have been much appreciated during my revision and I know I’ll be drinking the summer blends all through the summer months ahead. Thanks for taking the time to read my review, if you’d like more from my blog be sure to come find me on Twitter, Facebook or Instagram (or all three! ). 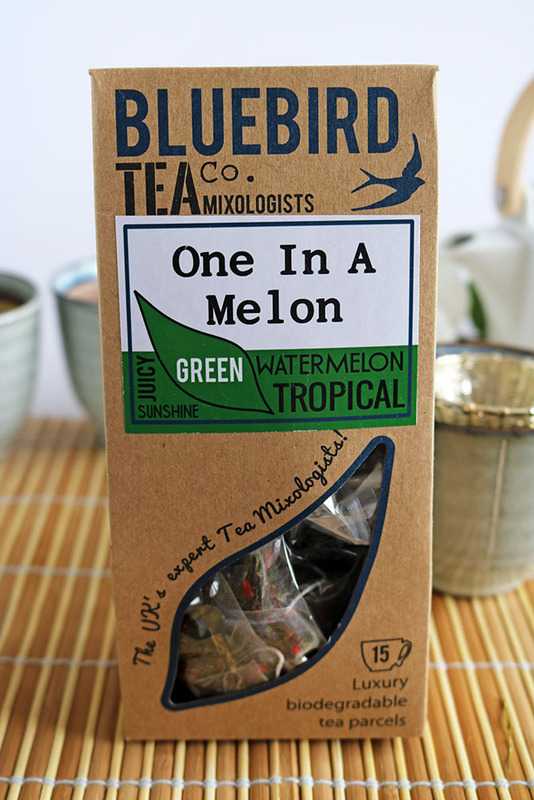 If you’d like to try these new blends yourself you can find them on Bluebird’s website. First up is a special hibiscus blend that I really adore. 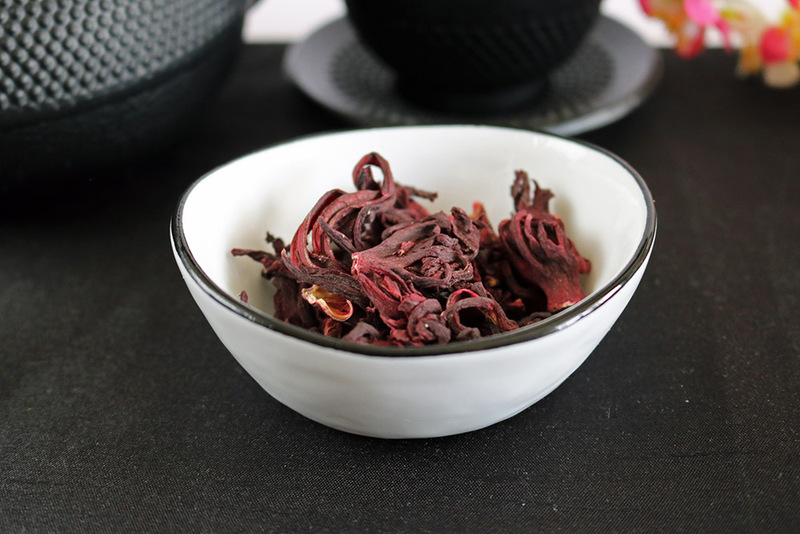 The tea is a deep purpley red colour with huge big hibiscus flowers, it looks really special in nice glass teaware with the flowers dancing in the deep red liquid. This is one of those blends that I literally could not imagine tasting nice, especially as I hate bananas! Adding pumpkin to the mix could only be a bad thing, at least that’s what I thought before I tried it. It’s always interesting to read the TeaTourist notes that accompany every tea in their subscription boxes, they have all the info about steeping time, temperature etc. This blend was described as being similar to banana milkshake, despite my bananaphobia I’ve always loved McDonald’s banana milkshakes. Crazily the banana-pumpkin combo really works, the banana is a sweet banana flavour and doesn’t taste like fresh bananas, it really does taste of banana milkshake (with a fraction of the calories). 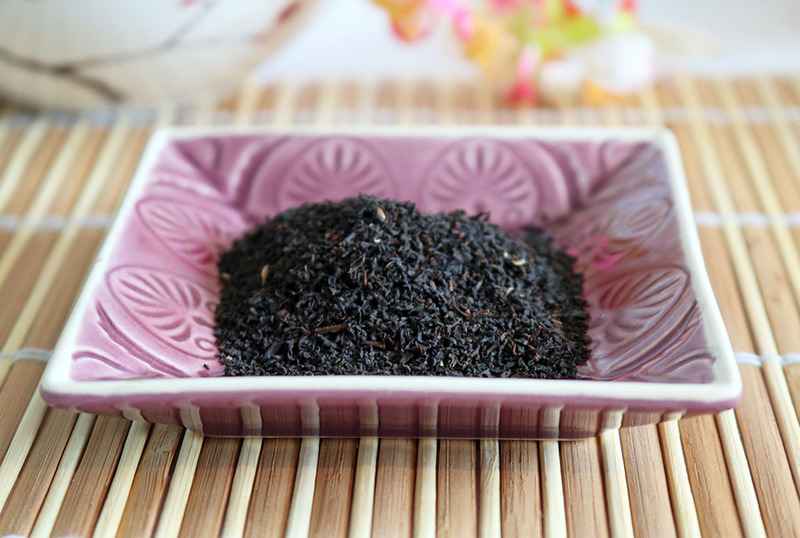 The tea is really fragrant when it’s steeped and gives off a cake-like aroma, another awesome tea! Although I don’t get particularly excited by mint tea it is always quite enjoyable and great for an upset stomach! 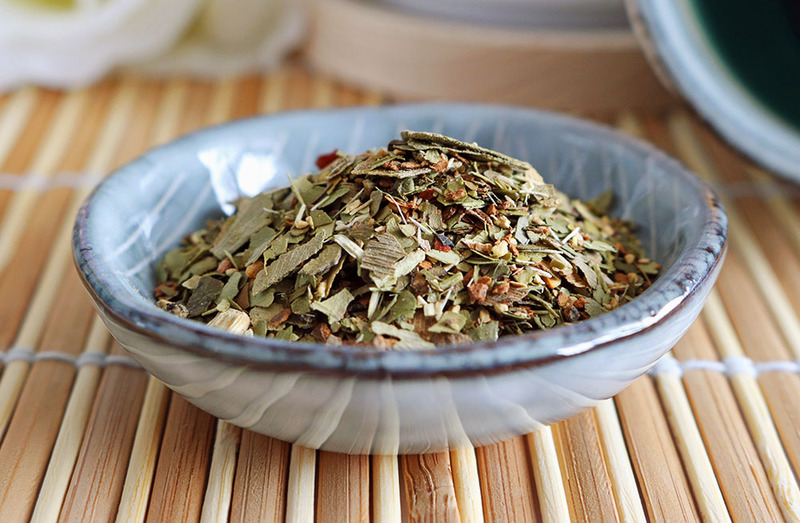 This mint tea is made up of large nice quality leaves, with a fresh scent. It’s fantastic to wake you up in the morning, as soon as the water hits the leaves a minty aroma breathes a breath of fresh air in to the room. Thieves is the perfect tea for people who enjoy a more traditional cuppa! I adore flavoured tea, I love exciting blends with cool names but sometimes it’s nice to have a good quality natural tasting tea. Thieves’ Brew has a deep dry malty flavour with a comforting fragrance that produces a nice golden liquid. I always invite my mum to try the more traditional blends as she’s in to natural tea with milk and she definitely enjoys this one! I knew this tea would be special as soon as I began steeping it. The chocolatey aroma with the warmth of the ginger smelt fantastic. Upon tasting it I was glad to find that chocolate was the dominant flavour and the ginger was a nice sweet cake-like ginger, I hate ginger teas that have more of a medicinal flavour which this doesn’t at all. This is without a doubt one of my favourites this month! This month’s TeaTourist box has been another fantastic selection of tea with something for everyone. Banana Pumpkin was the biggest surprise for me and Chocolate Ginger and hibiscus were AMAZING. If you’d like to try a TeaTourist subscription box for yourself you can get 30% off your first box using the code RUSSTEAS30 on their website. You really won’t regret it! Join my newsletter below to keep up to date with all my posts, competitions and news. 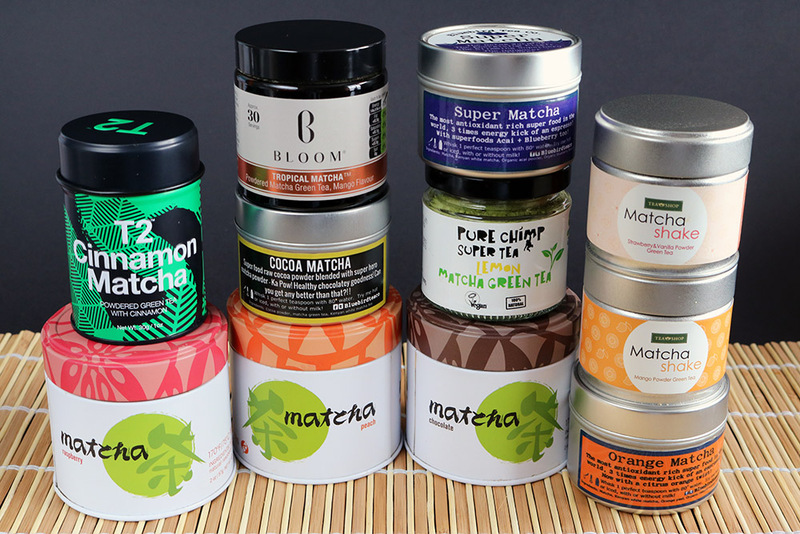 Ultimate Flavoured Matcha Comparison, Find Out Which Are The Best! I love matcha! it’s the best breakfast boost I’ve ever found, there’s nothing better to get you through that groggy morning feeling. I’ve noticed flavoured matcha popping up more and more, my collection keeps on growingso I thought I’d do a flavoured matcha comparison post! I won’t actually rank them or anything, don’t wanna be mean!  I’ll just give you a general run down of my thoughts about each one and they’ll be in no particular order. I made sure I used my matcha measuring spoon to ensure all the flavours were made with an equal amount of matcha. 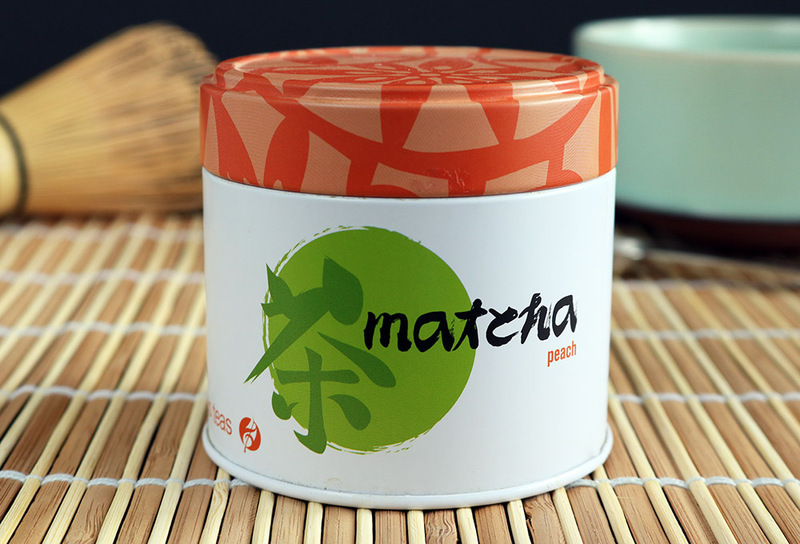 I really recommend it if you want to enjoy your matcha at it’s best, it’s really good quality and still looks great after a couple of years use! The first thing I noticed upon opening the tin is the smell, it’s mind-blowing, like freshly squeezed orange juice. This must be because it actually has orange peal and orange oil in it, which gives it an intensely refreshing zesty flavour. It’s good because it’s not over flavoured, you still know it’s matcha but it just has the lush addition of the orange flavour. It’s really really frothy, I mainly use an electric milk frother rather than a traditional whisk and the froth is wonderful. It’s very reasonably priced at £15 for 30g (at the time of writing), making it one of the cheaper options and you do get a lot of drinking for that £15. It’s a good choice for anybody that wants the health benefits of matcha (you must of heard about them by now! ), but aren’t fond of the natural taste of it. I found this while travelling when I stumbled in to a tea shop we randomly found in Barcelona. It has a really nice strawberry flavour that is just right, it’s not so sweet that it overpowers the matcha flavour but it’s definitely strawberry flavoured. It has a bit of a pink hue to the froth, which I assume is from whatever they use to flavour it. 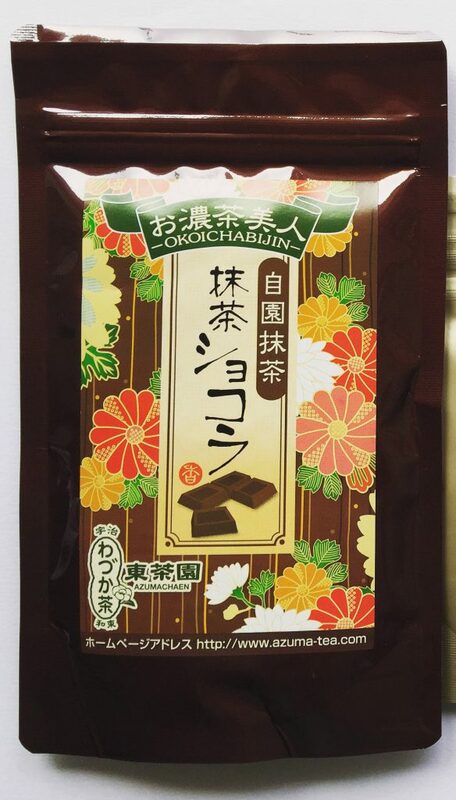 This is possibly the one that still has the natural matcha flavour the most which could be a good or bad thing depending on your preference. It’s got a slightly powdery feeling to it, I’m not really sure why, it possibly doesn’t blend as easily as others. Tea Shop make pineapple, cherry and caramel as well as a couple others that are included below! Adagio were awesome enough to send me their raspberry matcha and their chocolate matcha (more on the chocolate further down! ;). This is the first Raspberry flavoured matcha I’ve found and I sure was glad to find it! It smells amazing and the tins Adagio use for their flavoured matchas are stunning. The raspberry scent explodes from the tin before the lid is even removed and multiplies as you fully open it. 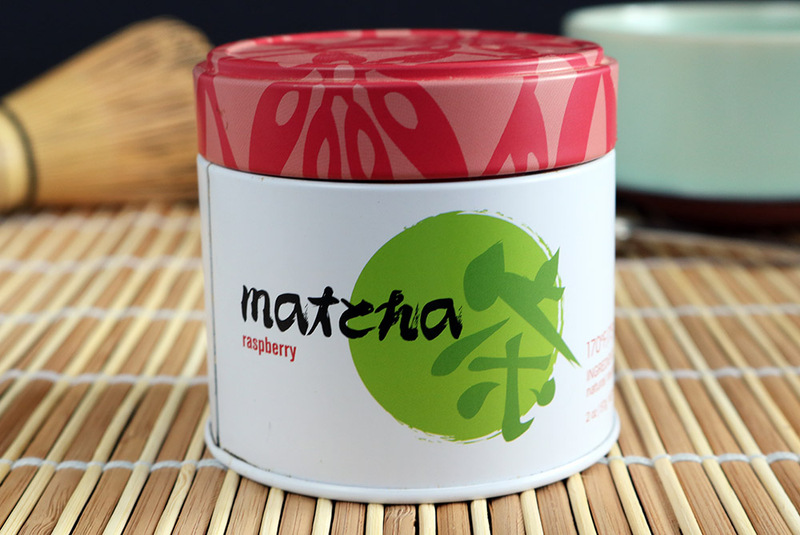 What I liked most is that the raspberry flavour doesn’t taste artificial at all, it’s really impressive how genuine the succulent raspberry flavour has been captured in this matcha’s dry powder form. Full review here. This isn’t technically flavoured matcha, it’s a flavoured instant matcha latte mix. I love matcha lattes but I find them hard to get when I’m out and about and I’m a bit too lazy to make them at home much. This is where these matcha latte mixes from Yunomi come in, simply add water and you have a matcha latte! I’ve been a fan of the unflavoured matcha latte mix that Yunomi have for a while now so I was super excited to try the flavoured ones. The chocolate one is definitely my favourite, it smells simply amazing and really does add a nice milk chocolate sweetness to the latte and the convenience of these mixes is amazing! Full review of chocolate, ginger and yuzu matcha latte mixes here. This is one of the most reasonably priced flavoured matchas I found as you get 50g which is more than most others. The smell is crazy strong, I was expecting a zingy lemon scent but it’s actually a really nice sweet lemon fragrance. 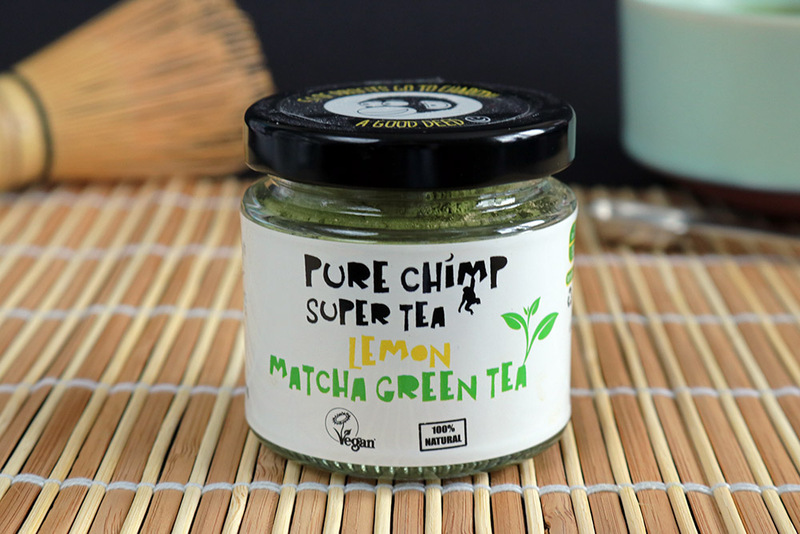 The flavour is also very sweet lemon and the matcha flavour is lost quite a bit as a result, the reason for the sweetness is Pure Chimp’s lemon matcha contains stevia to sweeten it. I’m a bit undecided about the stevia that’s been added, it does make the lemon flavour sweet and very different to the other flavoured matchas. Personally I’d prefer it to not contain any sweetener so I could add it if I wanted, plus I LOVE the flavour of matcha which is lost a bit. 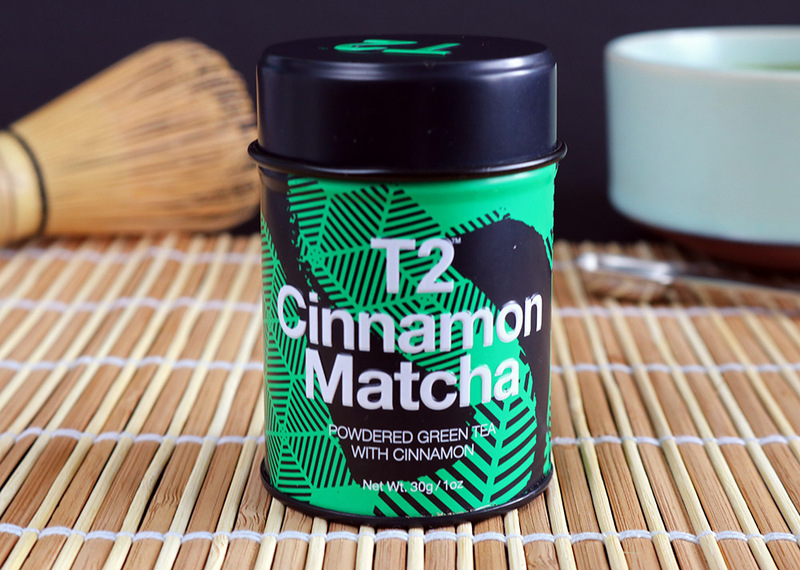 The addition of stevia makes this the perfect matcha for people who aren’t accustomed to the natural taste of matcha, a great way to get the health benefits in a sweeter form. This matcha is insanely frothy, one of the frothiest I’ve found and blends really quickly which is always good. Pure Chimp donate 5% of all profit to charity which is absolutely fantastic and really admirable. So if you prefer your matcha sweetened, love it frothy and would like to donate to charity this is the one for you. You can buy a jar here or a smaller pouch to try. I’m not really that much of a fan of peach as a flavour but it does seem to be a flavour that blends well with tea and the other Adagio flavoured matchas are so good I decided to give it a try. The smell explodes from the tin before you even open it (largely because the tins leak a bit in the post :p), it’s a mouthwatering sweet peachy fragrance that I really enjoy waking up to. Adagio’s matcha is always a bright vivid green and this is true for all of the flavours of theirs that I’ve tried. 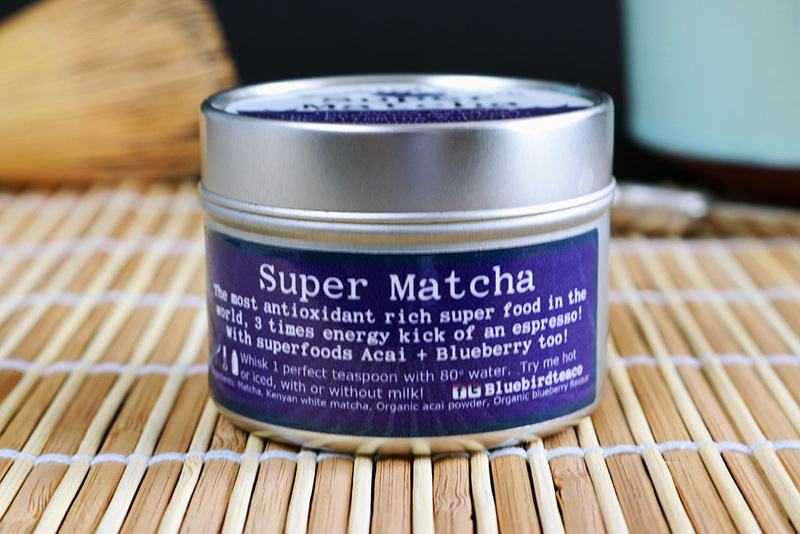 Next up is Bluebird’s super matcha, I heard so many good things about this so I had to give it a try. 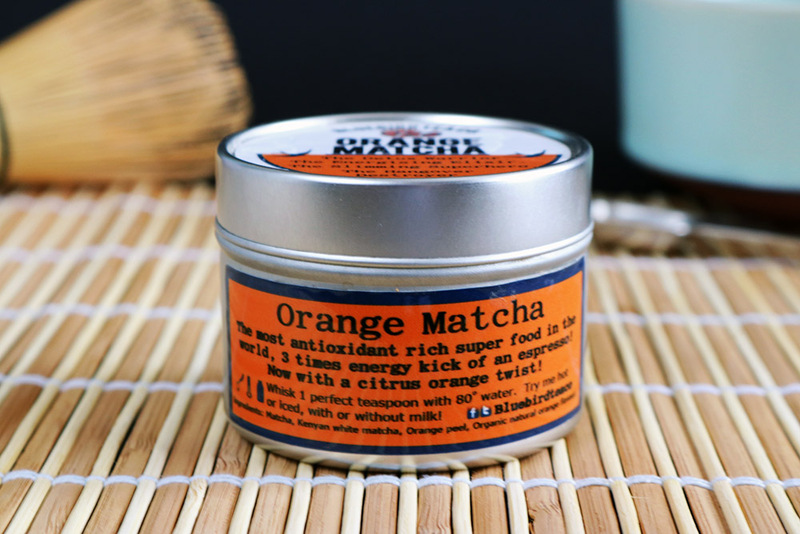 It’s a little bit more expensive than the orange matcha from Bluebird but you do get the added health benefits of Blueberry and Acai, which add even more antioxidants to the mix! It’s a beautiful bright green colour and is clearly very good quality. It’s just so fruity and tastes fantastic hot or cold so will definitely be enjoying this all summer! Chocolate is without a doubt my favourite food and matcha is easily one of my favourite drinks so I was overjoyed to find that the amazing people at Adagio Teas have combined the two! I must admit I did wonder at first how the two flavours would be blended together and which flavour would take centre stage, so I was thrilled when I found that the two flavours happily share the stage! This is another flavour I found in Barcelona along with the strawberry flavour above. 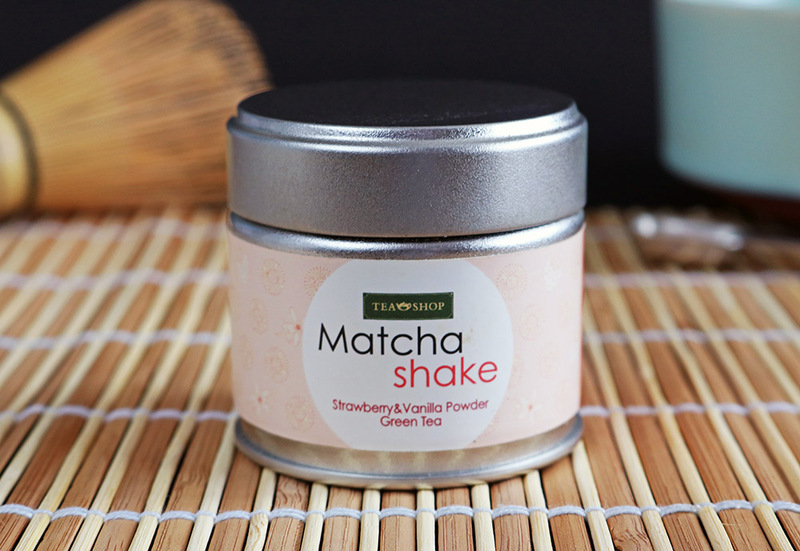 I loved the strawberry matcha but its downfall was it didn’t blend very well and tasted slightly powdery. 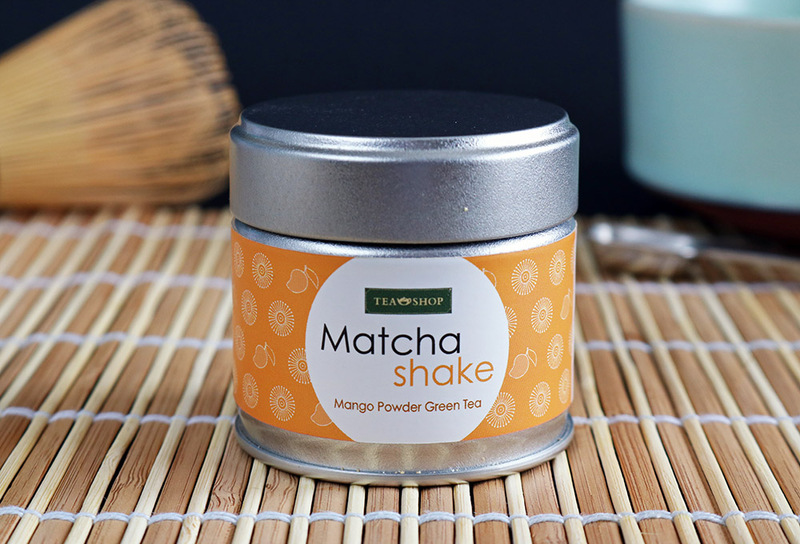 Luckily their mango matcha isn’t powdery at all and is really addictive! 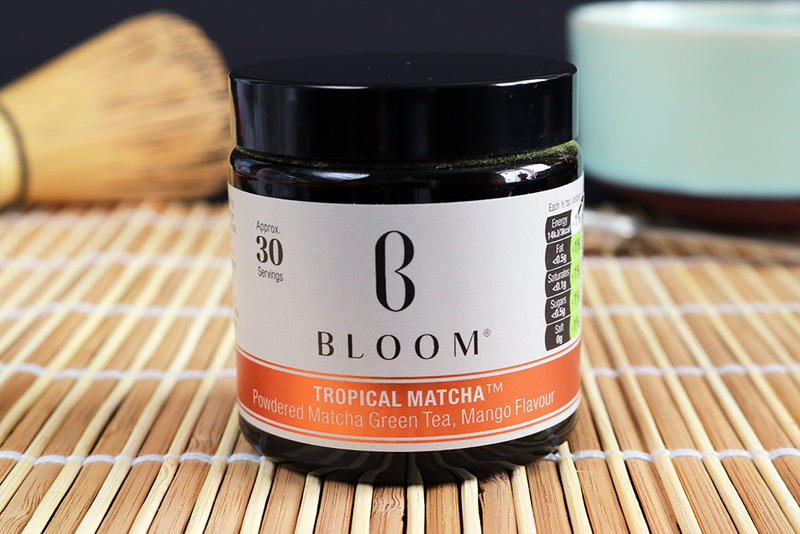 The mango flavour isn’t as strong in this matcha as the Bloom tropical matcha so I have to say I prefer the Bloom matcha but if you like a more natural flavour in your matcha this is for you. 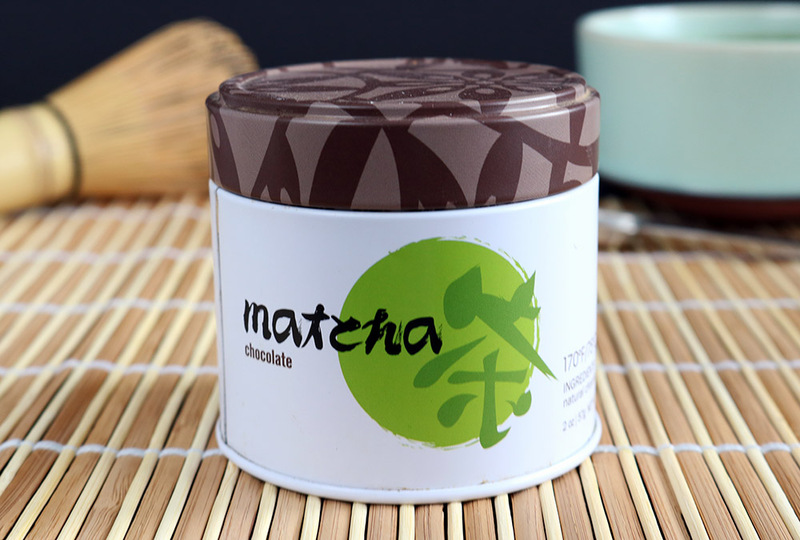 I really love both approaches to chocolate matcha so it really depends whether you’re more in to a natural approach to flavouring or a sweeter flavour. 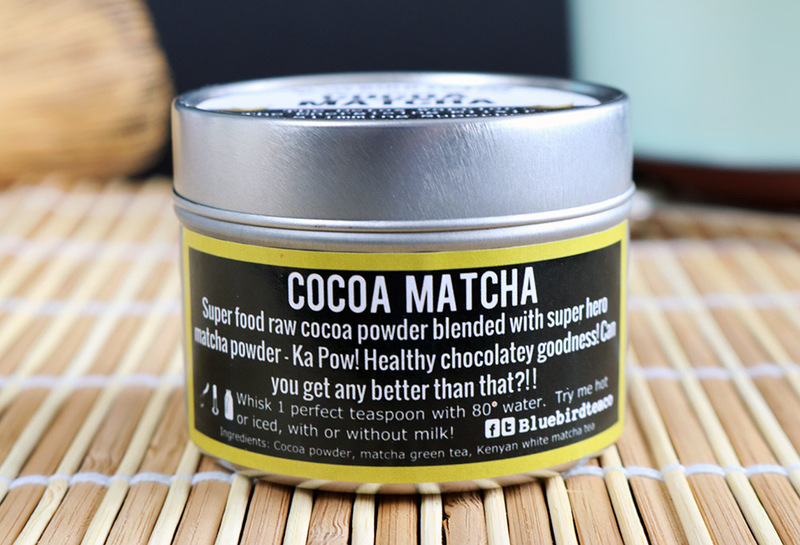 Chocolate has to be my favourite food so I’ll definitely be devouring this Bluebird cocoa matcha! Comment below with any flavoured matcha I’ve missed or email me if you’d like your flavoured matcha included in the list, I’d love to add it! 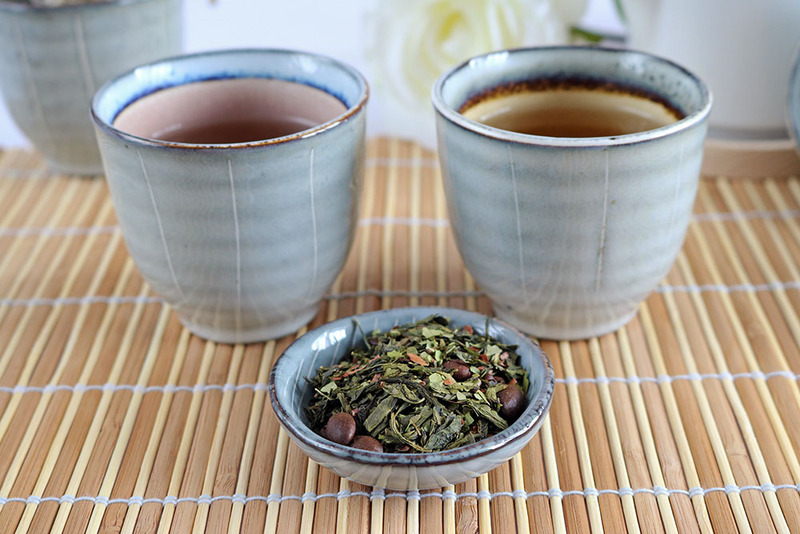 If you’d like to try exciting new tea each month then a tea subscription box is a good place to start and a TeaTourist tea subscription box is the BEST place to start! 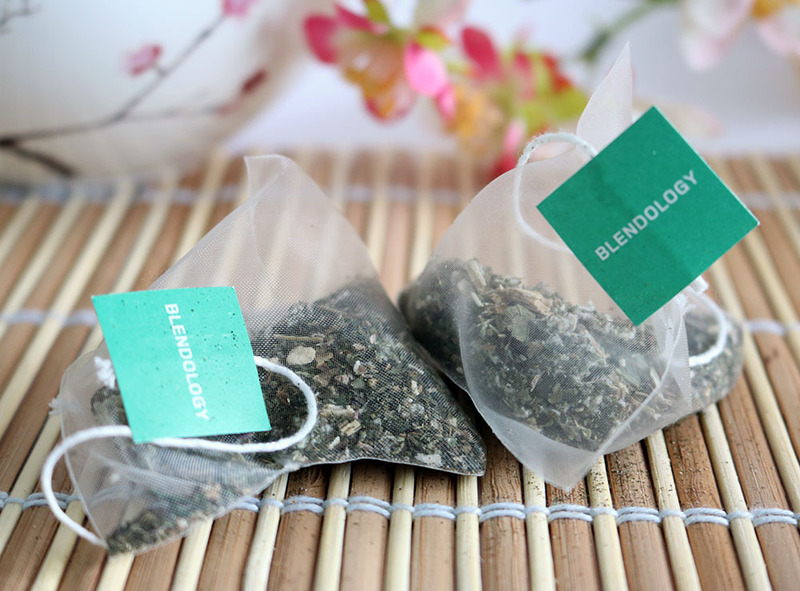 Each month you’ll receive a super exciting and varied selection of 6 teas with generous portions of each. I especially love the TeaTourist service because I can find out about a new handful of tea companies each month without having to hunt them down myself, super convenient for tea bloggers! Be sure to read on to find a voucher to get 30% off your first box! 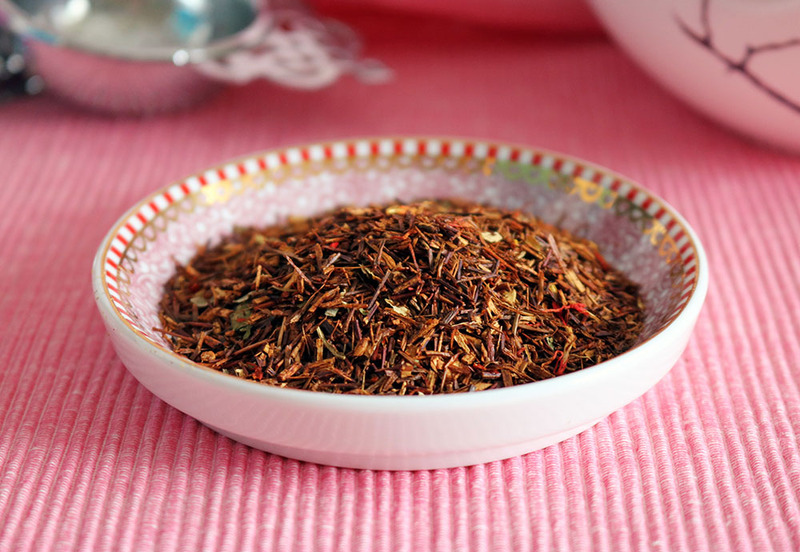 First up is Rose Strawberry Red Bush, an exciting and unique rooibos based blend. The smell of this tea really blew me away, it literally smells like strawberry laces that I had as a kid, I knew straight away that this tea would be special. I was immediately drawn to this tea by it’s candy apple fragrance and the warming spicy element. It’s always nice to see good quality, nicely sized apple pieces and the pretty yellow flowers are mighty inviting. 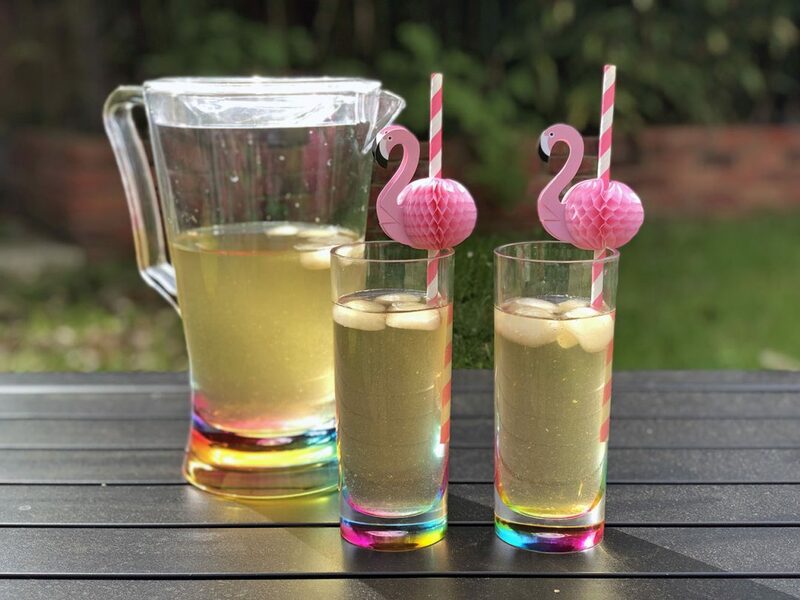 The apple flavours are most noticeable but the slight spicyness makes this tea perfect to cuddle up with on a cool Spring evening and dream of the warmer weather of the summer ahead. Another fantastic find! 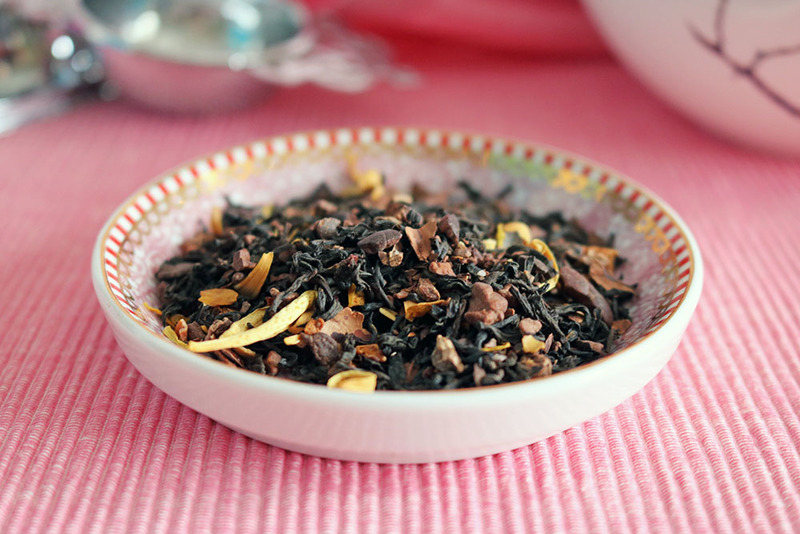 Chocolate Orange – Nelson & Norfolk Tea Co. I was ecstatic to see this blend in this months box, who doesn’t love a chocolate-orange combo!? I’ve found in the past that chocolate teas can be a bit of a let down, the promise of chocolate heaven often doesn’t carry across well. Thanks to the overload of chocolate goodness added to this blend it doesn’t at all suffer from a lack of chocolate flavour. I looked forward to trying this blend as it’s pretty unique, as can be expected from nearly all of TeaTourist’s picks. I hadn’t had honeybush tea before so I wasn’t sure what to expect but it was pretty awesome! 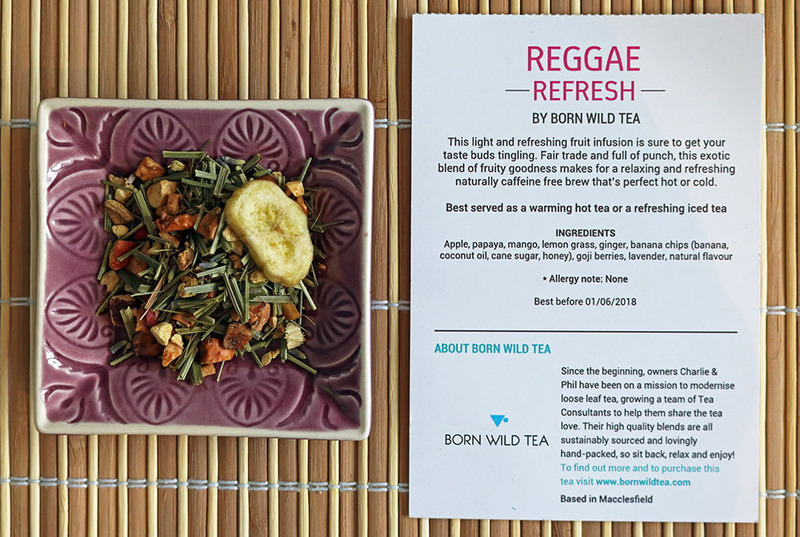 It didn’t have the standout flavours of some of the other teas in this months box but I still thoroughly enjoyed it, it reminded me of rooibos but a little less nutty and more earthy. A good choice if you’re looking for something you haven’t tried before and tend to not be a fan of crazily flavoured tea, preferring more wholesome and natural blends instead. Tumeric Chai – Chai Kai Tea Co.
I’m a big chai fan, I adore chai lattes either from Starbucks or made at home with A LOT less sugar! 😉 I’ve been enjoying turmeric matcha the last few months which I love so I was excited to see what this tea had to offer. 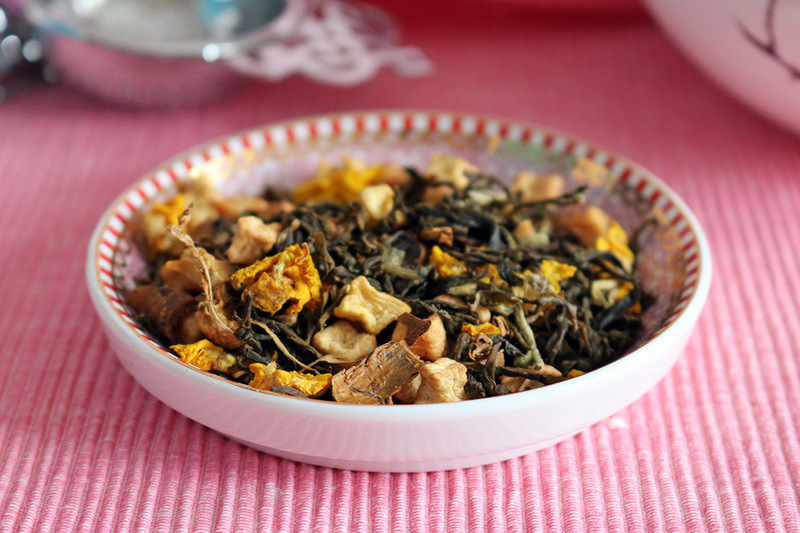 The turmeric twist ensures this is a tea that’s always at the front of your tea cupboard! Turmeric is also being hailed as a cure-all at the moment (it’s like matcha a year ago :p) so the health benefits are an added bonus! Honey and lemon is a road well travelled in the tea world but that doesn’t mean it can’t be awesome! This tea smells almost medicinal before it’s steeped but it’s watered down (literally :p) when you brew it, causing a beautiful honey lemon fragrance to waft through the kitchen. 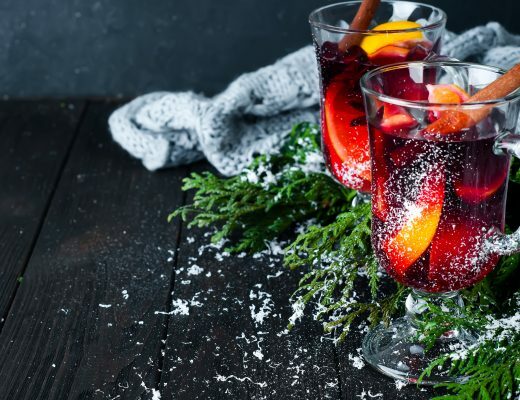 The flavour is smooth with a rich honey taste blended with just the right amount of lemon, without it being too citrusy. I feel like this tea would be perfect to cuddle up with and soothe a cold but that doesn’t mean you can’t cuddle up with it if you don’t have a cold! Overall a really good blend that I’ve definitely found myself drinking a lot of. Thanks for taking the time to read my review of this months TeaTourist subscription box. A massive thanks to the guys and girls at TeaTourist for sending me this box to review. To get 30% off your first TeaTourist subscription box and go on a tea adventure yourself use code Russteas30 on the TeaTourist website. 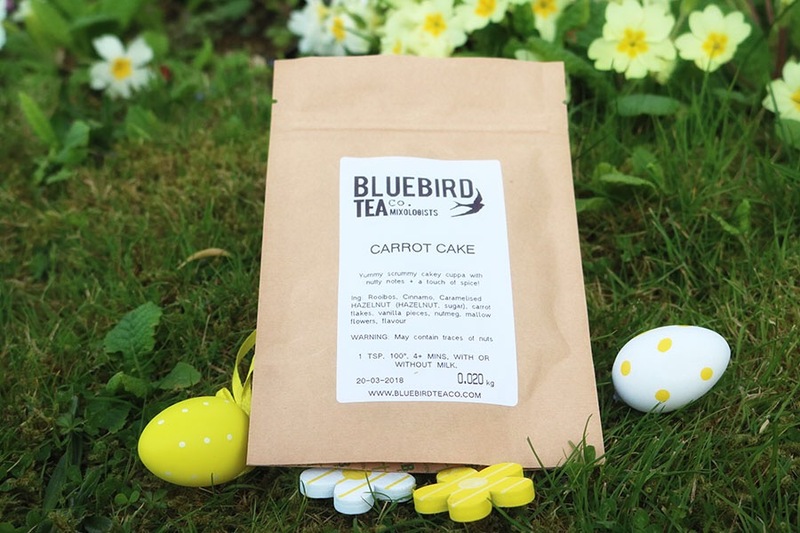 Bluebird Tea Co. Spring & Easter Teas Reviewed! I’m really excited by the inventive packaging Bluebird have used for their spring line up, it’s always nice to see tea packaged in unique and different ways. 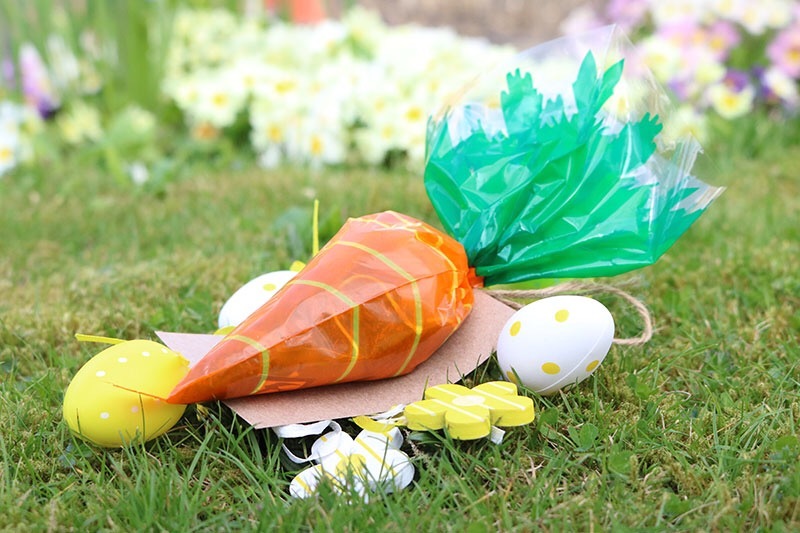 There’s a carrot filled with teabags and an egg box with plastic eggs filled with tea that you’re gonna love! The range includes Carrot Cake, Hot Cross Buns and Easter Eggs Nests, along with favourites MojiTEA and Earl Grey Creme. 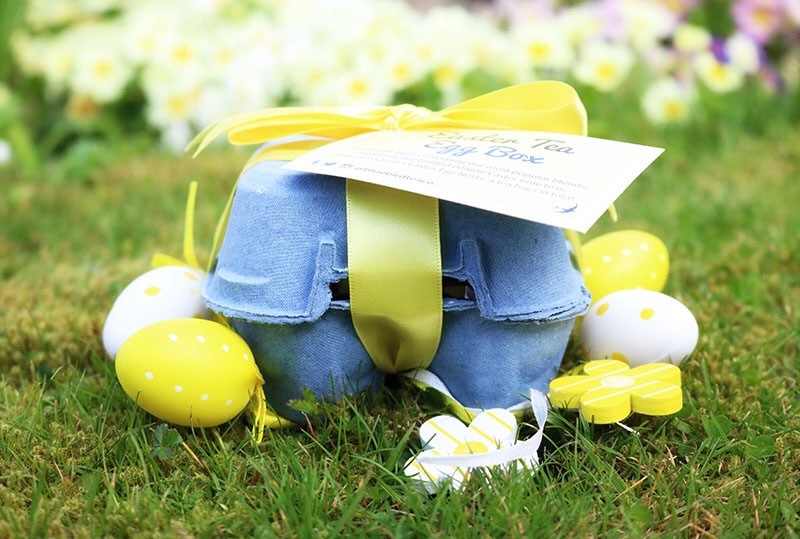 First up is Easter Egg Nests, which I aboslutely adore! These teabags smell insanely chocolate, I could literally smell them all day! The green and black tea combo works perfectly and the toasted rice is fantastic. All round one of my favourite Bluebird teas of all time! 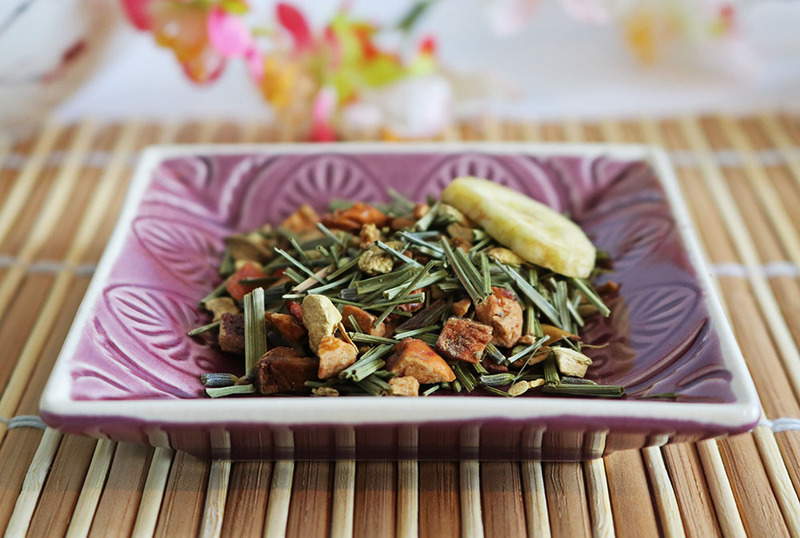 This tea has a really nice sweet spicyness to it that really embodies the essence of Easter and Spring time. It has a beautiful cinnamon flavour, which is paired perfectly with the sweet Rooibos base to create that sweet glazed fruity flavour of a good hot crossed bun. It’s quite similar to Bluebird’s gingerbread chai but less spicy so if that’s one of your favourites you’ll love hot cross bun too. 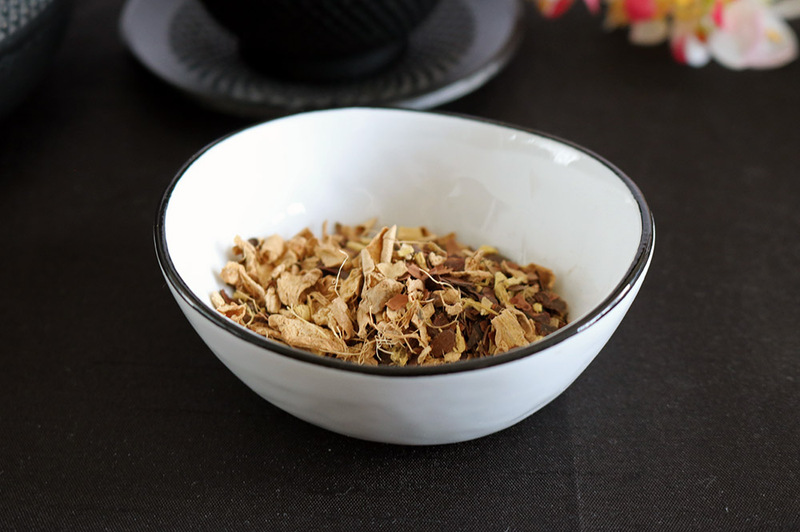 This tea produces a beautiful amber coloured tea with a slight spiced flavour and hints of cinnamon. I particularly like the subtle vanilla aftertaste which is immensely addictive! I’m not a huge fan of Earl Grey, it’s one of those teas I’ve just never found that exciting and some earl grey I’ve had has been real bad! I knew if I was going to enjoy anyone’s Earl Grey it would probably be Bluebird’s, I don’t think I’ve ever had one of their teas I didn’t like! 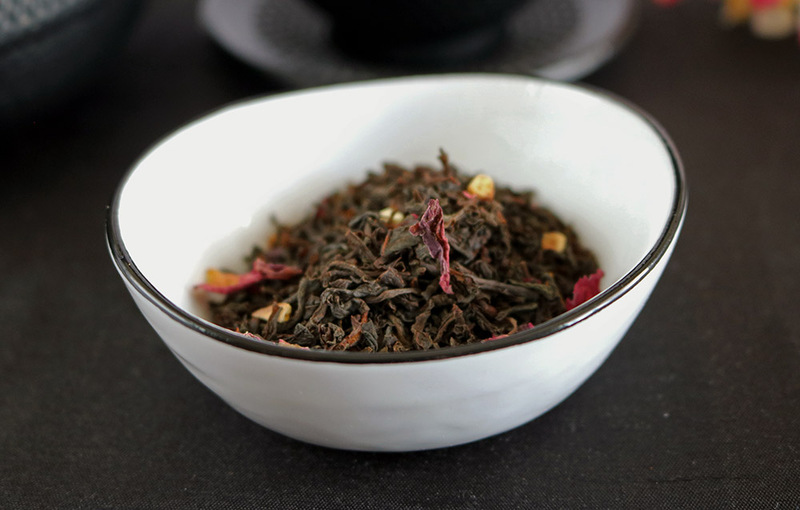 I began steeping this tea and was hesitant as I usually find the bergamot too overpowering in most Earl Grey and can usually tell from the smell. The fragrance of this Earl Grey definitely had a sweeter note to it and I was excited to see if this carried over in to the flavour. It definitely did! The bergamot flavouring was just the right strength and didn’t overpower the black tea flavour like a lot of Earl Grey I’ve had in the past. MojiTEA was another one of the teabags included in the purple egg box! The egg box with the tea filled eggs inside was probably the highlight of this collection, it’s definitely the most inventive tea packaging I’ve seen. I loved the refreshing mint flavour and I was pleasantly surprised by a sweeter aftertaste than a lot of mint tea. MojiTEA isthe perfect tea for anyone who struggles to get going in the morning, it instantly wakes you up with it’s cool mintyness. You’ll get several infusions from one teabag and it’s even more refreshing cold. 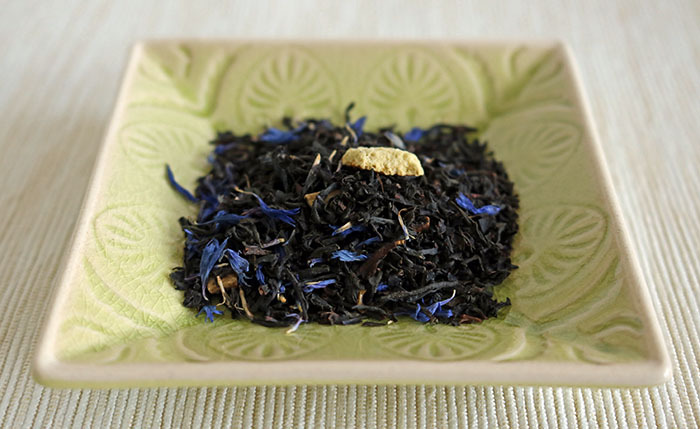 If you’re a mint tea lover you’ll love this exciting blend Bluebird blend! 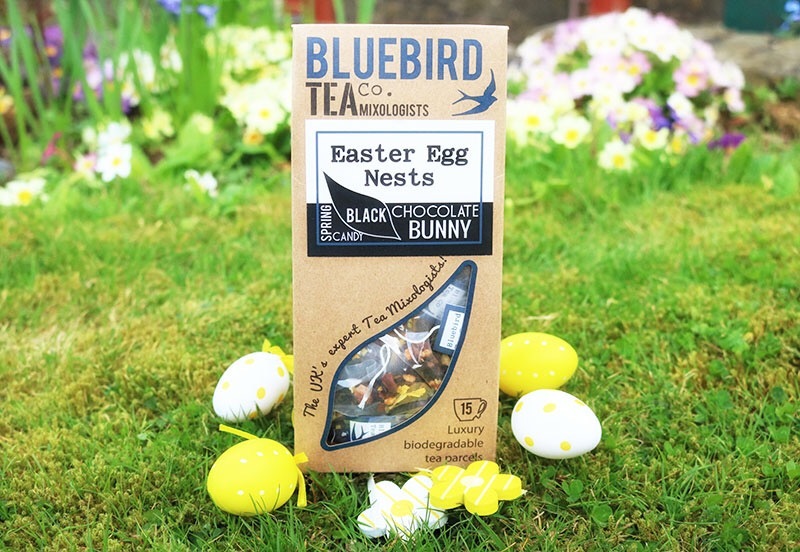 That pretty much rounds up my review of these Bluebird Tea Co. Spring/Easter teas. A huge thanks to Bluebird for sending me these teas to review, I really enjoyed them! 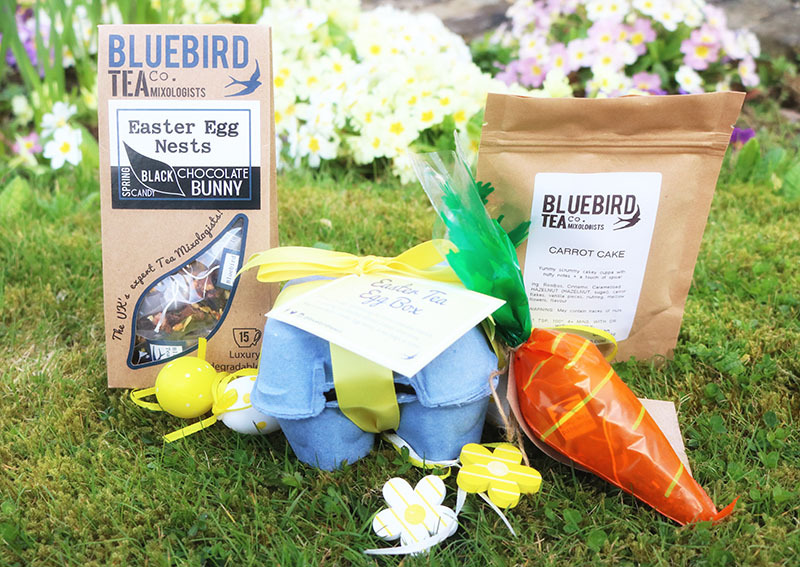 The egg box and carrot are two of my firm favourites in Bluebird’s Spring/Easter teas. If you’re looking for an alternative to chocolate as an Easter gift for someone these would be absolutely perfect (and much healthier!). If you’d like to try any of Bluebird’s products you can find their website here. Thanks for taking the time to read my review, I hope you’ve enjoyed it. Please share it with the tea lovers in your life and come find me on Twitter, Instagram or Facebook. Join my mailing list for more posts, competitions and tea related fun from the Russtea’s blog! Lately much of my tea drinking has been tea from my TeaTourist subscription boxes, it’s so exciting to have a varied and well selected set of teas arrive each month. 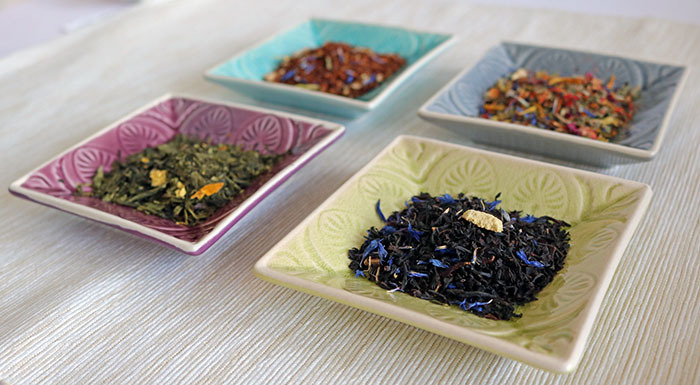 A Tea subscription box is perfect for anyone that would like to be more adventurous with their choice of tea, especially if you don’t have time to find the different teas yourself. The box fits straight through your letterbox and includes 6 different teas, with a very generous serving of each. Be sure to read to the bottom for a voucher code to get 30% off your first TeaTourist subscription box. This is my third subscription box from TeaTourist and all three have been fantastic, if you want to read my other two reviews you’ll find them here and here. I’m a huuuuge Tea in the City fan! 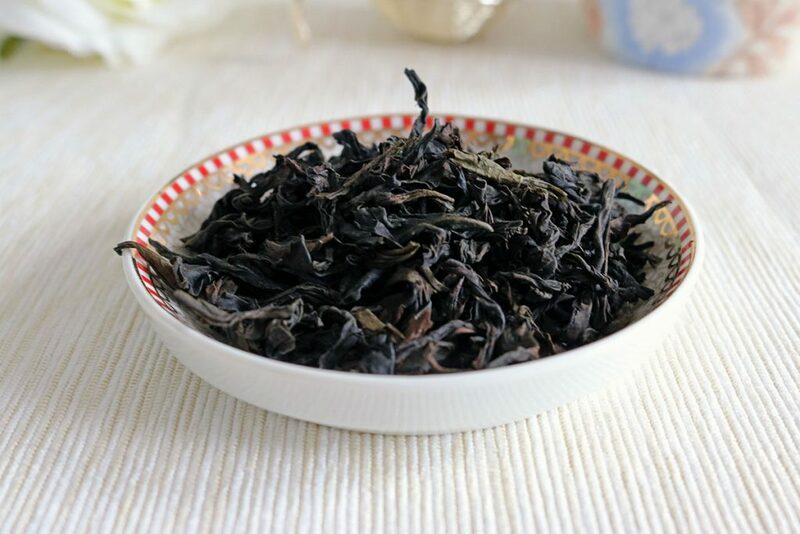 I’ve reviewed their Yunnan Gold and Wuyi Black, followed by their Cranberry Leaf and Rosebay Willowherb. 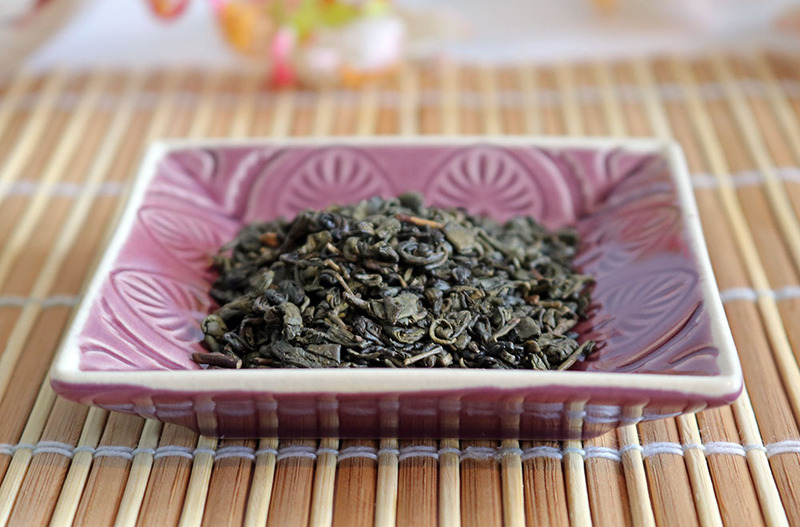 I’m also a big Oolong fan so I knew this tea would be pretty special as soon as I saw it, and I was right! 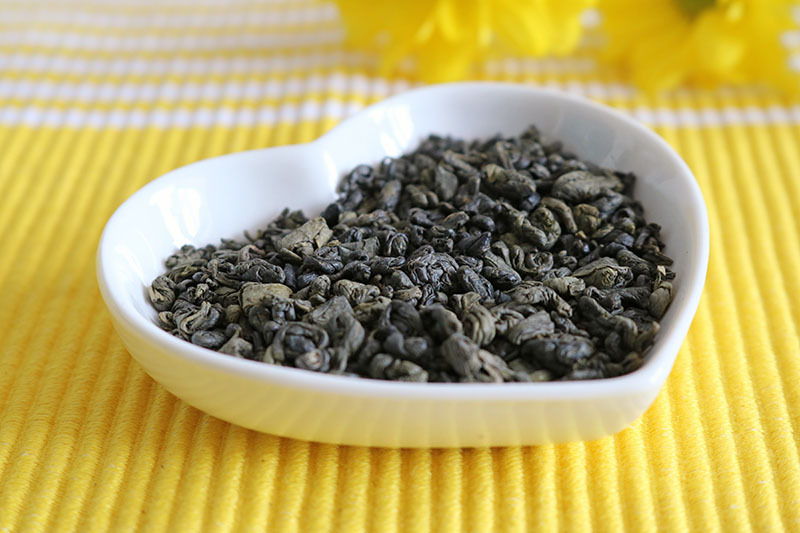 Ben Shan Oolong is a deep green with a pleasant vegetal aroma, with leaves that really open up when you steep them. This is a great tea if you like to infuse your tea multiple times and it’s really satisfying to observe the change in flavours as you reinfuse. The smell of this tea blew me away! As soon as the packet opens a super sweet cherry aroma bursts in to the room, it reminds me of cherryade but much much healthier! Alongside the cherry fragrance there’s a slight rose hint too, creating a perfectly paired smell. When I steeped the tea the cherry aroma became even more incredible, I found myself hovering over the mug inhaling! 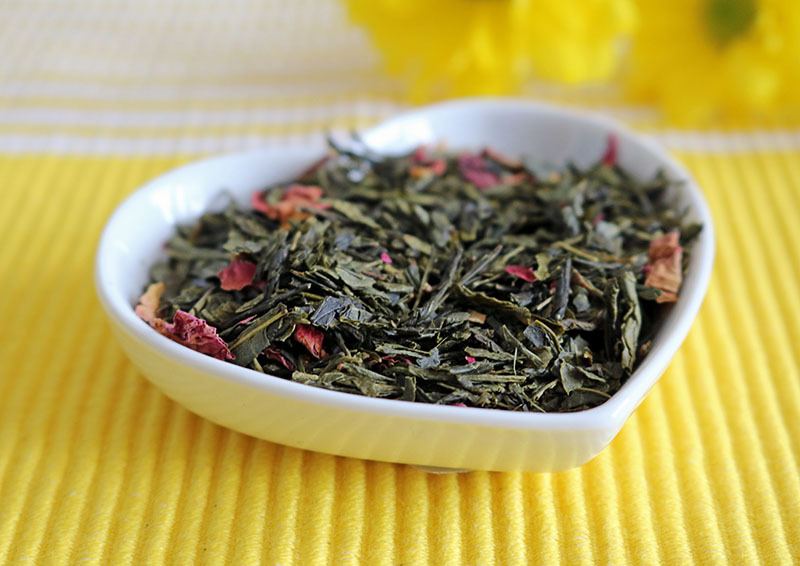 I love the classic sencha flavour of this tea, which is the perfect match for the beautiful cherry sweetness. The hint of rose is also noticeable in the flavour but I like that the cherry flavouring takes centre stage. Brockley Breakfast -Good & Proper Tea Co.
Breakfast blends aren’t really the blends I reach for when I’m looking for new tea but my mum loves them so I do keep some in the house, she’s more of a traditional tea and milk kind of lady. 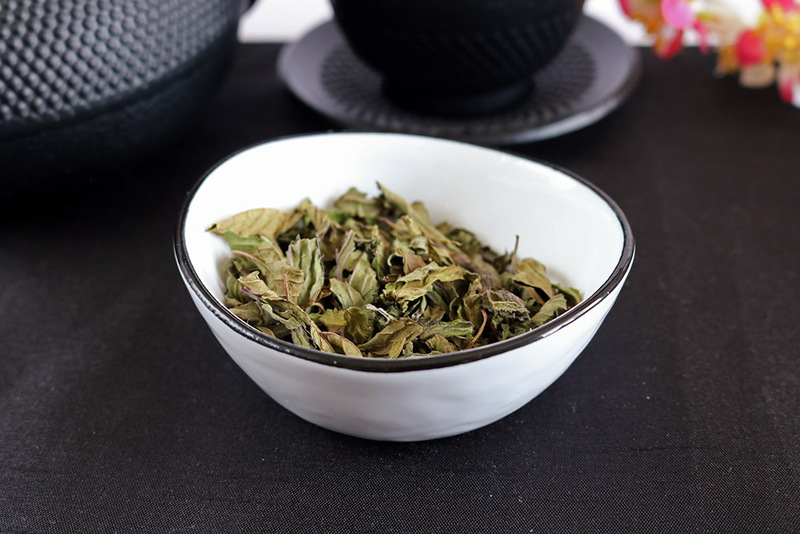 The leaf in this blend is very evidently high quality, which can be seen in the rich amber tea it produces once steeped. Brockley Breakfast has a deeply satisfying malty flavour with a subtle sweetness that I really enjoy. I left the traditional tea and milk test up to my mum (I don’t drink milk) and she was thoroughly impressed, I’m trying to convert her to a loose leaf lifestyle so this is a step in the right direction! Next up is the smokey blend no. 45 from Edgcumbes Tea Blenders. 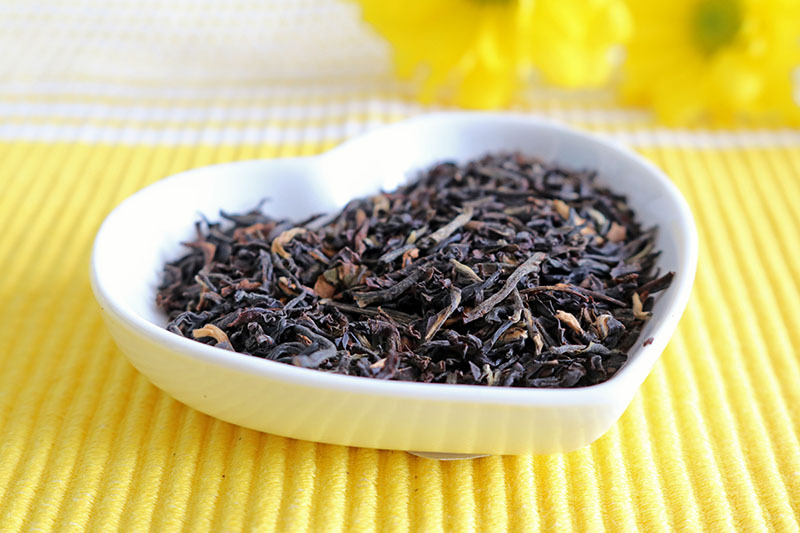 This tea is a combination of Lapsang Souchong, Assam, Keemum and Darjeeling. I’ll be honest, I usually hate smokey tea, it always feels like I’m licking a bonfire but I was excited to find out how it tasted when combined with unsmoked black tea. 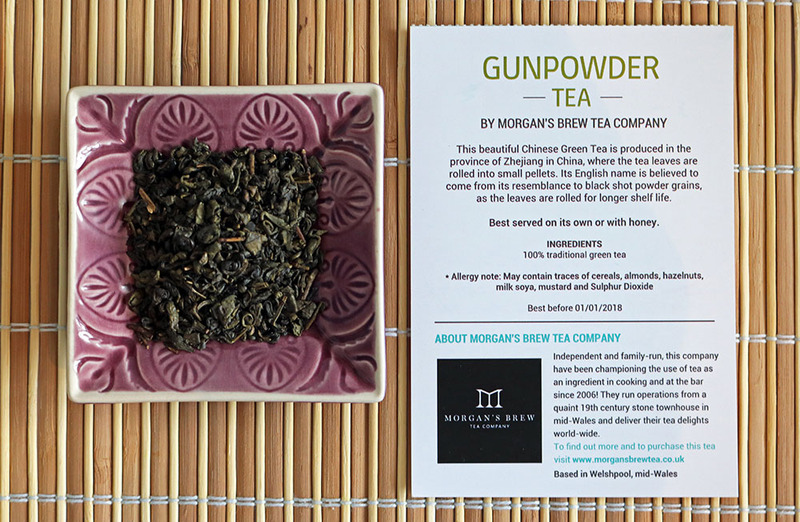 I’m always excited by gunpowder tea, I love to watch the small deep green pellets open up as you steep them and I’m addicted to the vegetal flavour and zingy aftertaste. Thanks for taking the time to read my review of the February TeaTourist subscription box and I hope it’s helped you decide if a tea subscription is right for you! If you’d like to try a box you can use a voucher code TeaTourist were awesome enough to give me for you guys. Simply use RUSSTEAS30 to get 30% off your first box, you won’t be disappointed! I’ve been getting in to tea subscription boxes recently, I love the convenience of not having to look for new and exciting tea and just having it arrive once a month. It’s perfect as a tea blogger to have the tea found for me and to find out about a handful of new tea companies each month, it’s difficult to explore new tea companies if you just want to sample their tea without a big order so this really works for me. Each month True Tea Club send 4 carefully selected teas, the box fits straight through your letterbox so you don’t need to be in when it arrives. It’s particularly convenient that you can also buy more of any of your favourites from each box, directly from True Tea Club. Another nice touch is the option of three tiers of subscription, with either 40, 60 or 80 cups in each months box. 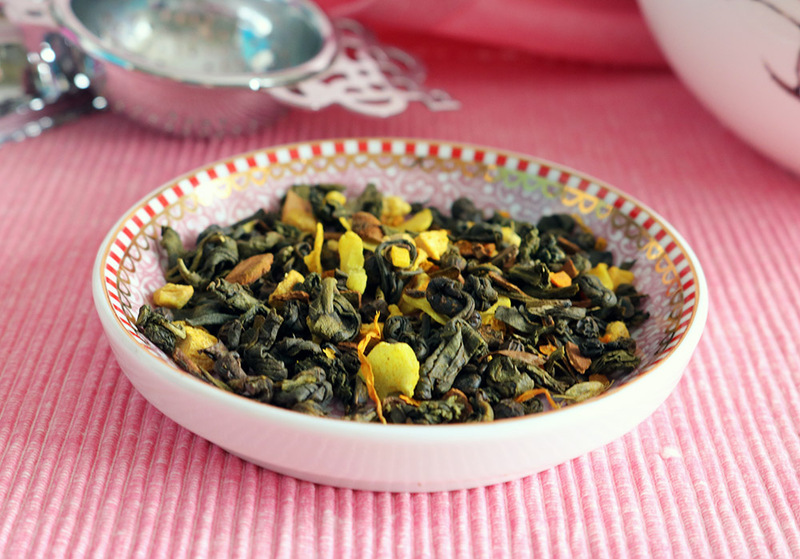 First up is a beautifully colourful, aptly named fruity tea. 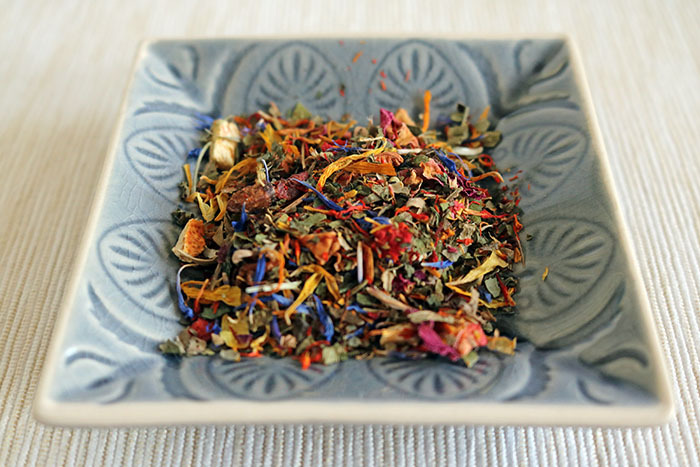 The tea looks stunning loose, with bright and exciting colours and smells delightfully fruity but fresh with a hint of mint. I’m usually not a fan of mint tea and really haven’t found many I’ve liked but this was different. The flavour was dominated by a sweet Apple and strawberry flavour, with a nice floral hint and just the right amount of mint to add freshness, without being overpowering. I adore mango and always find it’s the perfect accompaniment to green tea so naturally I was excited to see this tea in my subscription box. As soon as I opened the packet a fresh and juicy mango fragrance erupted in to the room! 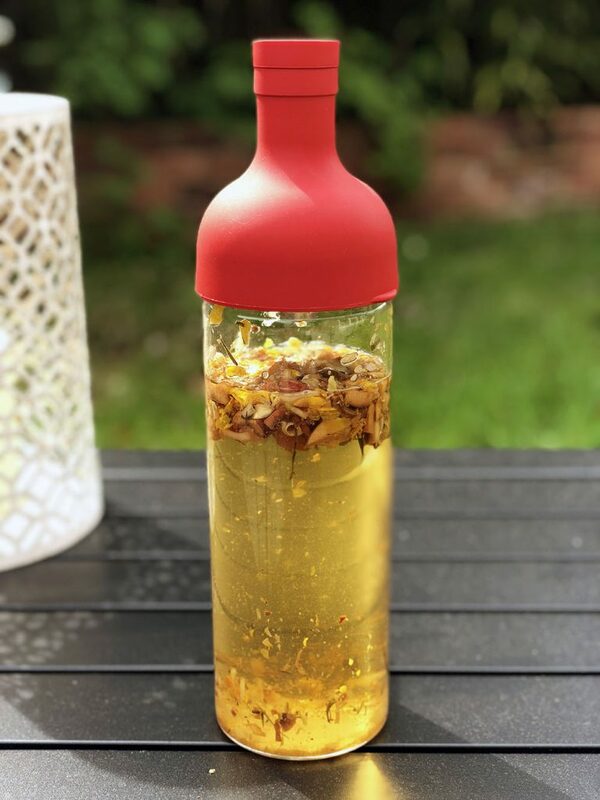 The mango is paired with a perfect amount of high quality green tea that creates a beautiful golden drink that I could sit and smell all day! 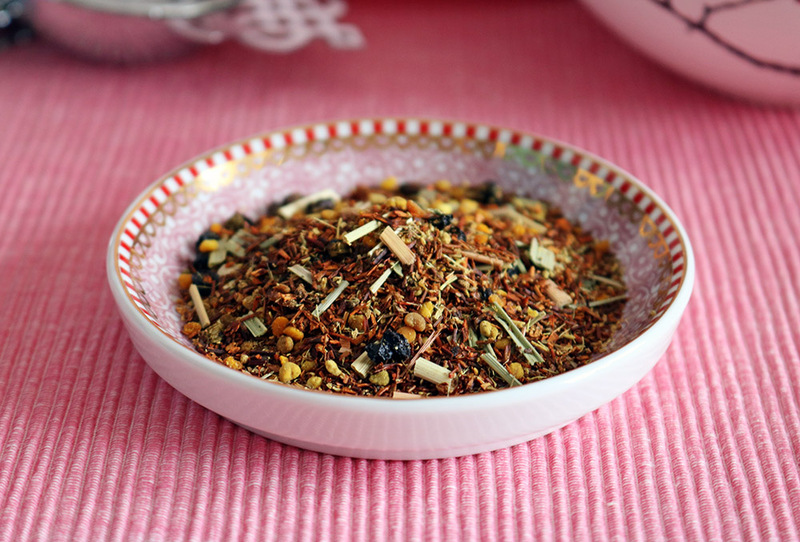 I always find rooibos is really economical so this blend goes a lot further than the others. 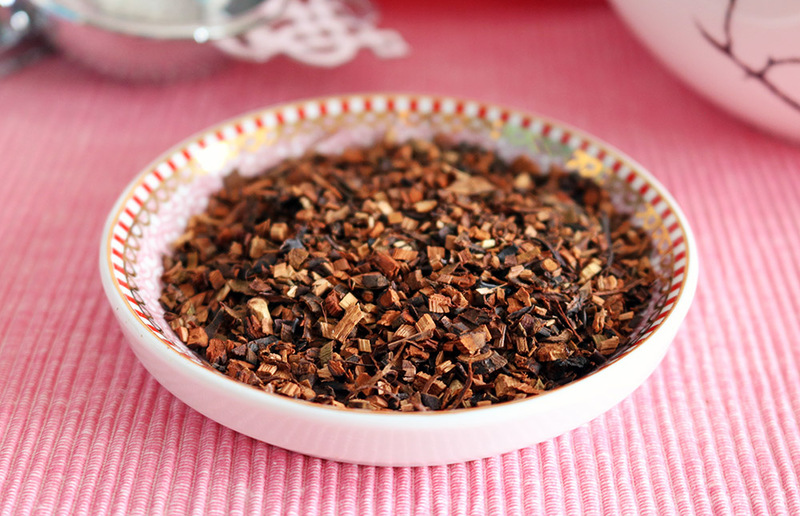 All in all Vanilla Cupcake is an awesome tea that I’m sure every rooibos fan will love! Earl grey is a tea that’s a strong favourite among tea fans but I kinda feel it’s a bit played out but I was excited to see how this one compares to others I’ve tried. 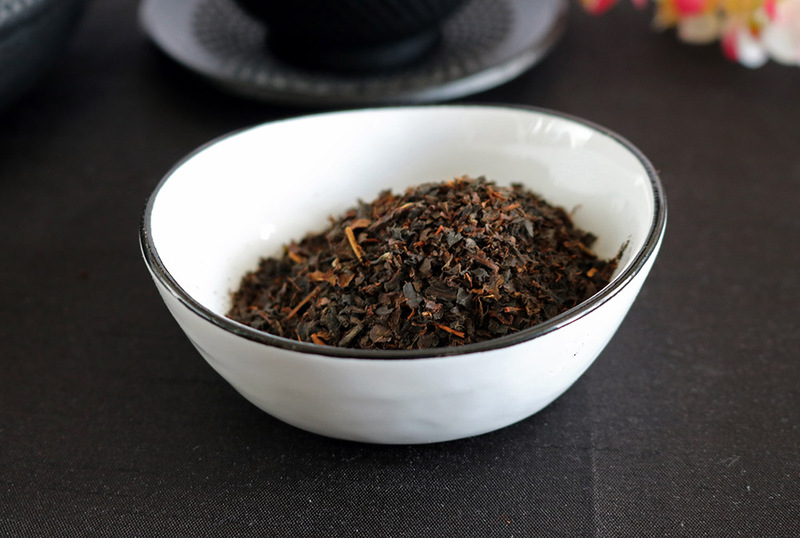 I find a lot of Earl Grey is overly flavoured and you lose the beautiful black tea flavour but Earl Grey Rebel is expertly blended and manages to successfully retain the malty black tea flavours I love. It does have a definitely noticeable citrusy bergamot flavour but not to the point that it’s like drinking a scented candle, which many I’ve tried recently have been. The scent of this tea is also very appealing and matches the name of the tea well. 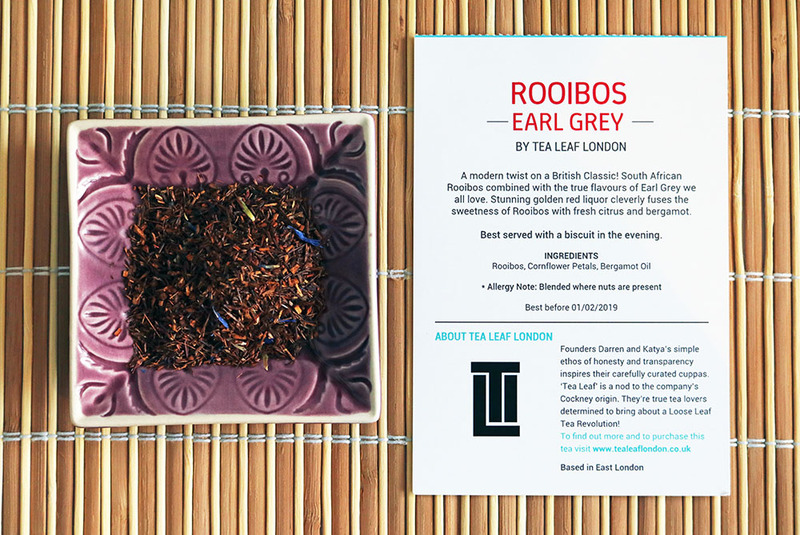 This is certainly one of the better Earl Grey’s I’ve tried recently and I’m sure Earl Grey fans will adore it! My time with this month’s True Tea Club subscription box has been thoroughly enjoyable. I love the convenience of the service and that I can easily order more of the blends that I love. You can get 50% off your first subscription box with True Tea Club by entering LOVE at checkout, meaning you can try your first box for as little as £5.00! You can subscribe easily on the True Tea Club website. Thank you so much for taking the time to read my review, if you’ve enjoyed it please join my mailing list below or come and find me on Twitter, Facebook or Instagram. I’m extremely excited to share another awesome TeaTourist subscription box with you! 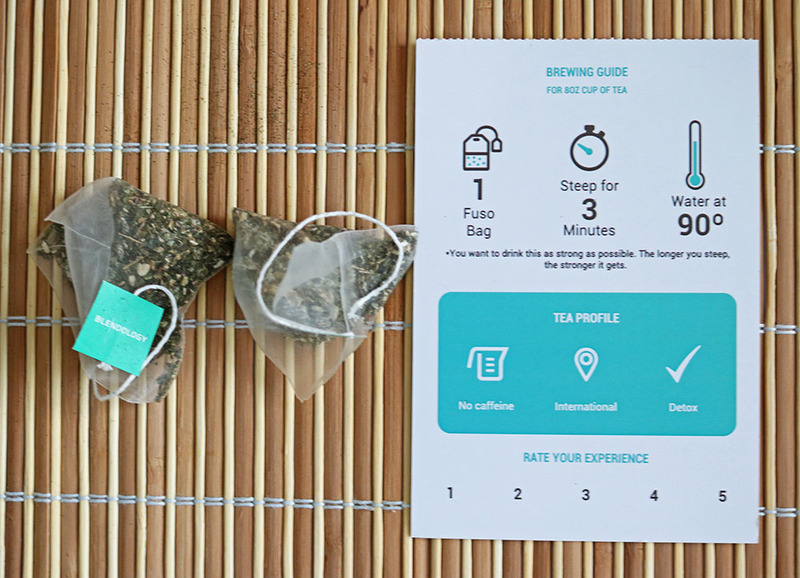 If you’re new to tea subscriptions TeaTourist is a great one to start with. You get 6 teas instead of the 4 that you usually get from other tea subscriptions. The packaging is beautiful and a joy to receive through the post, it also slips straight through your letterbox which is super convenient. 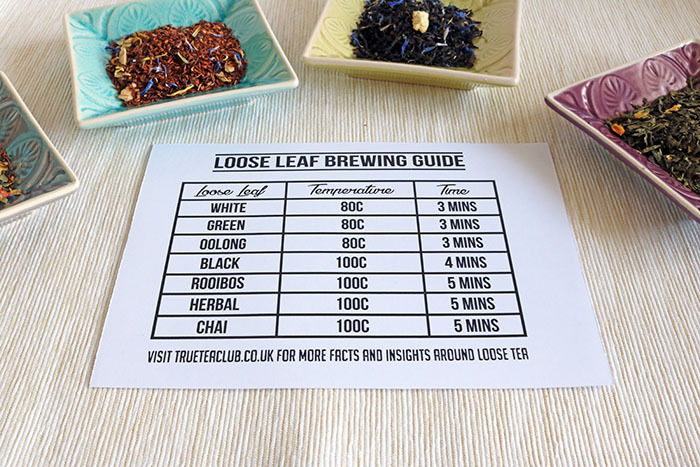 All 6 teas come with a brewing card which gives you some information about the tea and the company it comes from, as well as water temperature and brewing times. If you’re getting more immersed in the joys of tea I’d highly recommend a multi-temperature kettle to guarantee you enjoy your tea at its best. 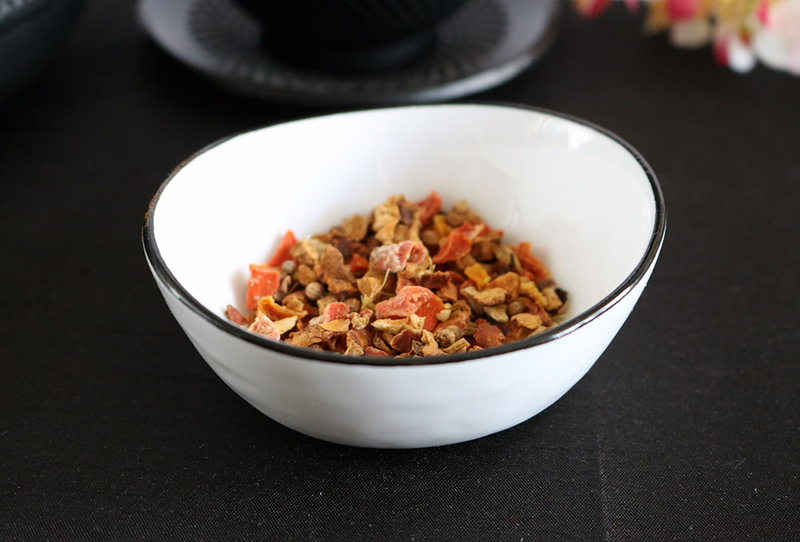 This tea is a really interesting combo of different fruits, including banana chips! It has an exciting zingy mango aroma to it with a hint of banana, giving it a wonderful tropical feel. The smell only gets more intense once you begin steeping it. 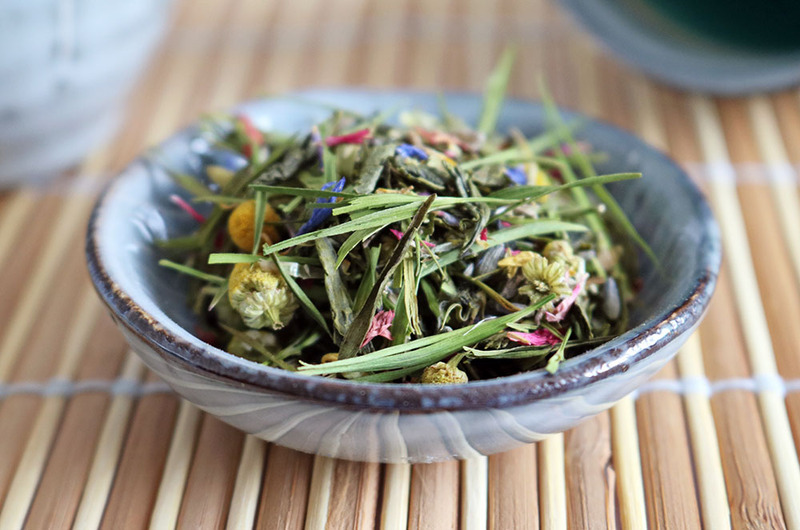 It creates a beautiful yellow brew with a deeply satisfying lemongrass flavour, alongside a nice sweet fruitiness. 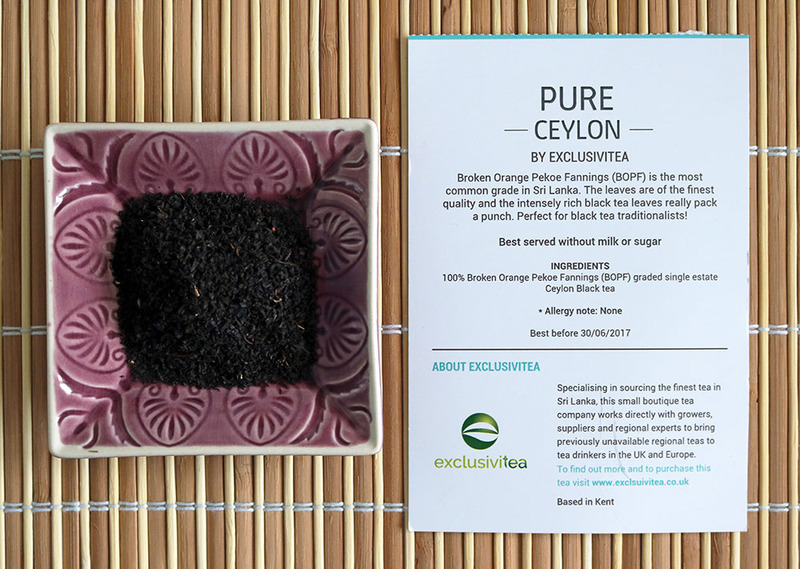 I really enjoy the variation of tea that the TeaTourist subscription boxes offer and this tea is another fine example. I’m really addicted to flavoured tea, I find it most exciting and I’m always hunting for something new and unique. Every so often I’ll receive some unflavoured tea that blows me away and this is certainly an example of this. I love the deep rich malty smell of this tea, it’s a tea you just want to cuddle up with a big mug of and enjoy the fragrance. It has a complex flavour, combining a deep maltyness with subtle earthy tones and a sweet aftertaste. This is the second rooibos earl grey infusion I’ve tried and it’s a flavour I always enjoy. 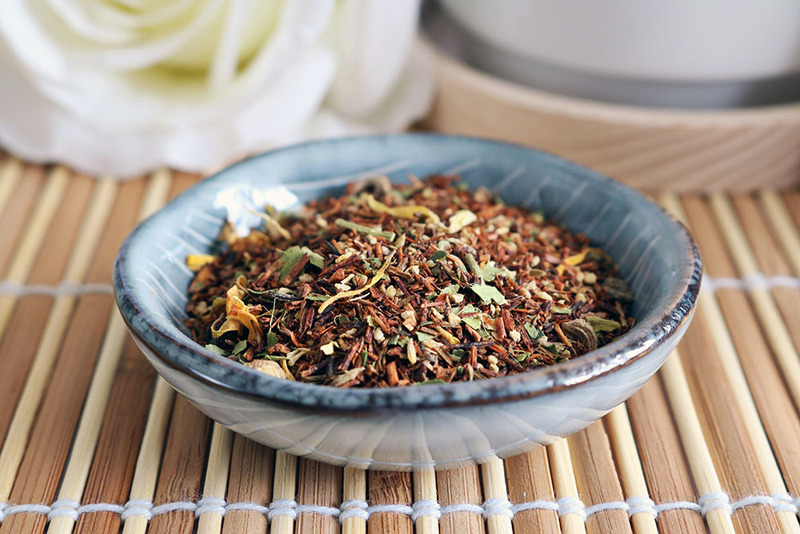 I love rooibos and drink it a lot at night, I struggle to sleep a lot so rooibos is a perfect caffeine free fix. The smell of this tea is incredible, it has a gorgeous citrusy fragrance that I could smell all day. 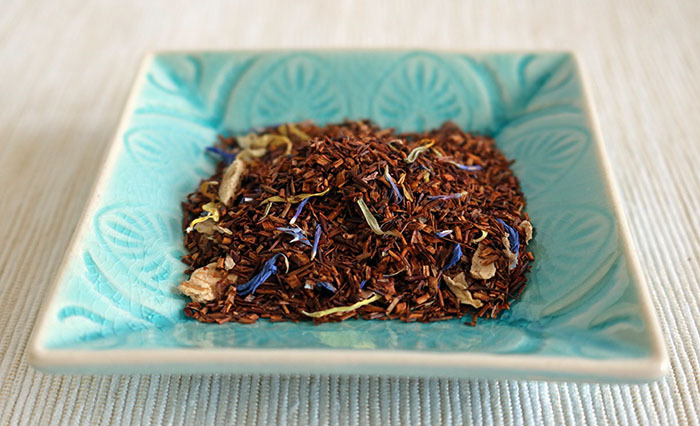 I always find rooibos goes a long way and this is certainly the case with this tea. The amber colouring of steeped rooibos is always enjoyable to watch and looks fantastic in my glass teapot. The citrusy flavour from the bergamot comes through nicely without being overpowering. I like that you can still definitely taste and enjoy the nutty rooibos alongside the citrus tones. I LOVE green tea, it may even be my favourite kind of tea! 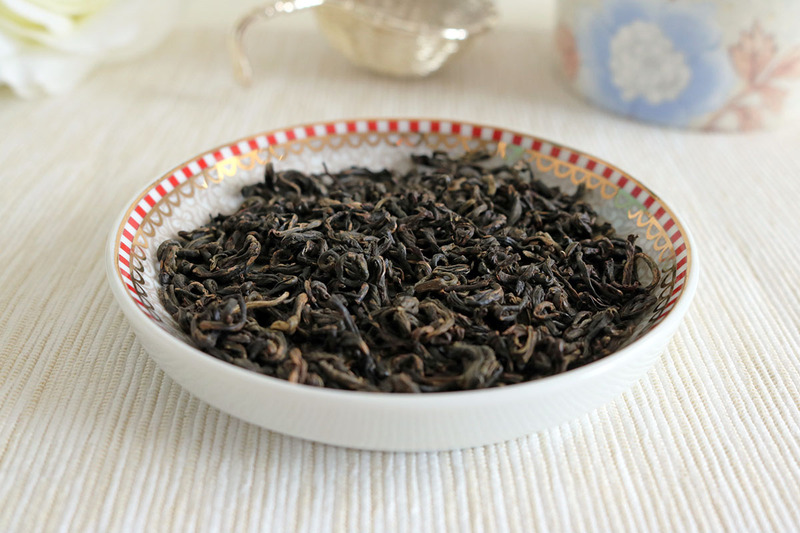 I love the vegetal flavour, the slight zing and the crispness of gunpowder tea and this tea definitely embodies these qualities. The portion of this tea is particularly generous given how much flavour erupts from a small amount. The leaf is really nice quality with a deep green colour, it’s a joy to watch the leaves unfurl as the water turns a stunning golden colour. The tea has an addictive crisp vegetal flavour and a nice zing after every mouthful. This is definitely one of my favourites from this box! I was absolutely thrilled to find matcha in this box. Matcha is one of my favourite things in the world, I drink it every morning with my breakfast and often have another bowl with lunch. 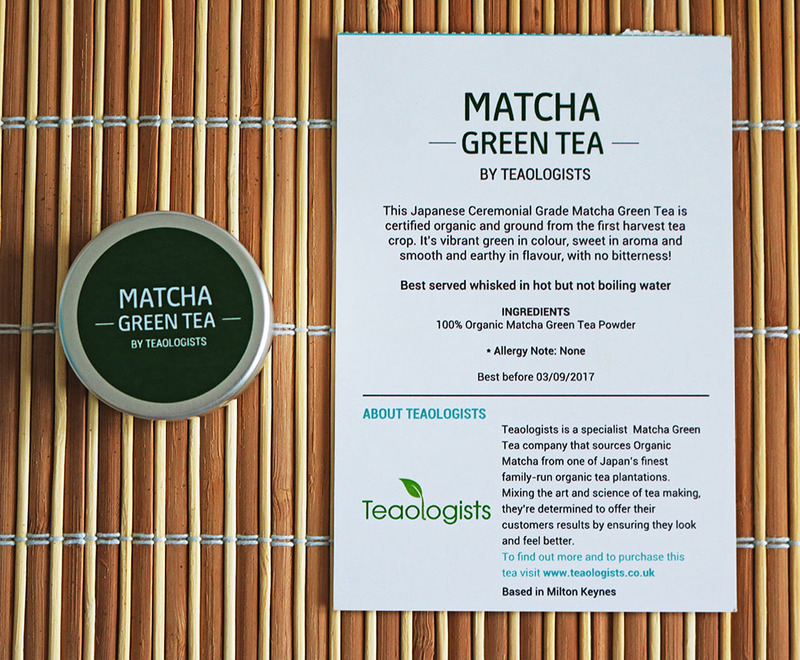 The inclusion of matcha in a tea subscription box is definitely something I haven’t seen before and a really unique idea from TeaTourist. 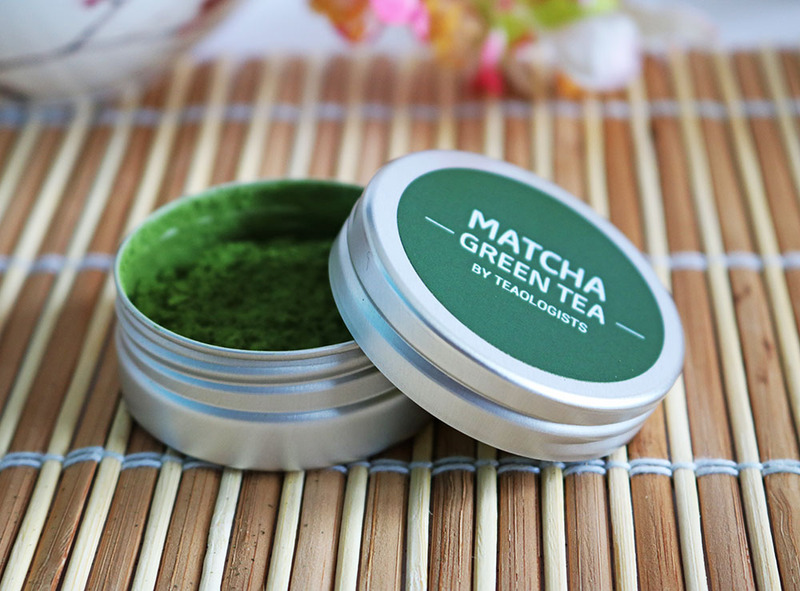 The matcha is packaged in a little tin and knowing how expensive matcha often is I was pleasantly surprised by how generous the sample was. If you haven’t tried a tea subscription box yet I’d highly recommend choosing TeaTourist as your first tea subscription, take a look at their website for more info. TeaTourist have even been awesome enough to provide a discount code for my readers to get 30% off their first box, simply use RUSSTEAS30 at checkout! Thanks for taking the time to read my review. If you’d like to talk tea or get regular updates from my blog you can find me on Twitter, Instagram or Facebook and sign up to my mailing list below.